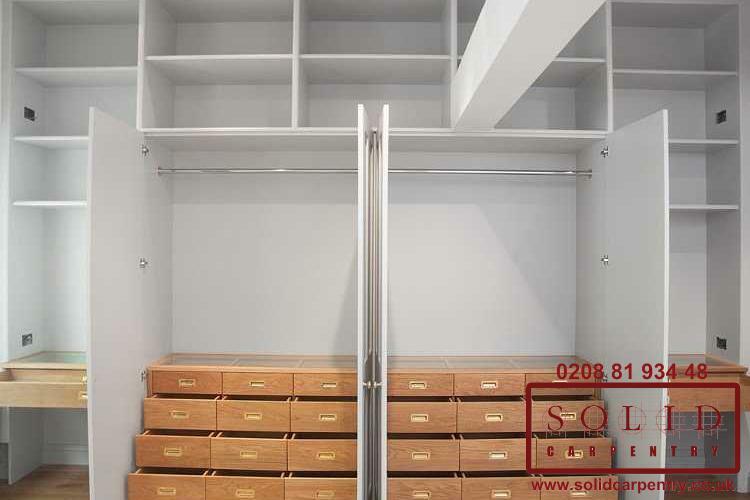 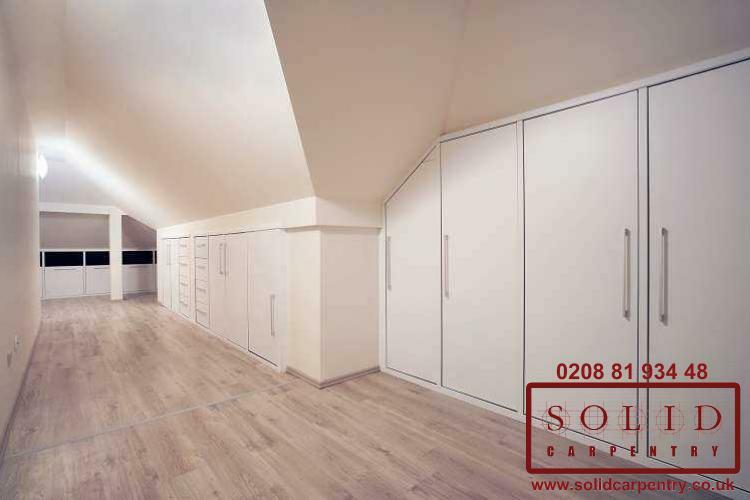 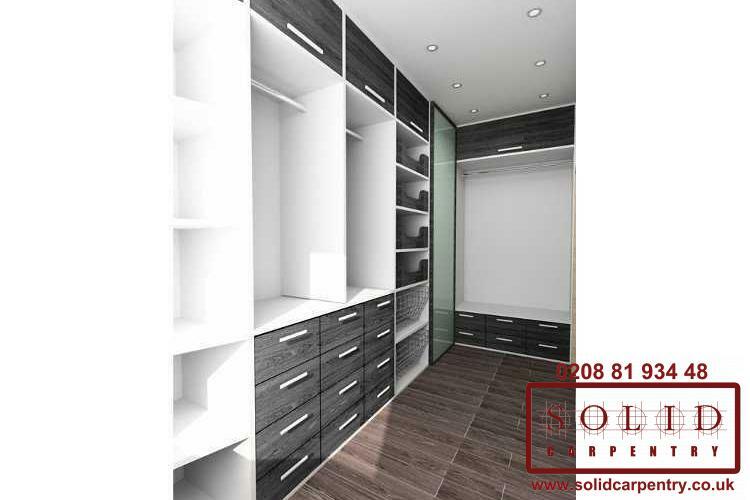 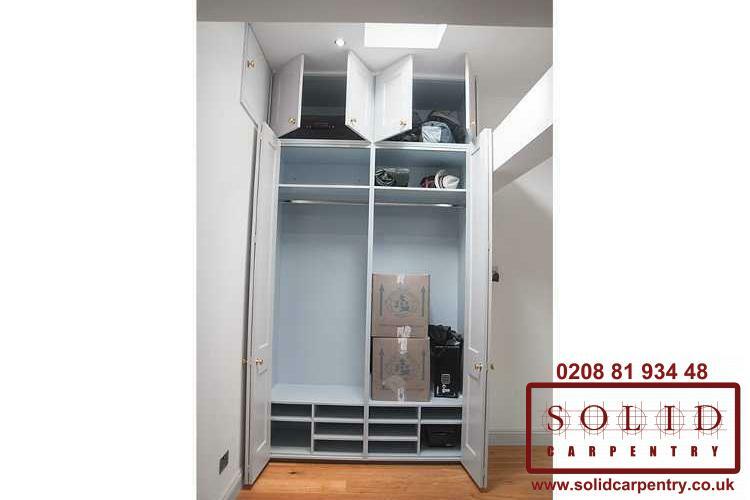 Bespoke storage units can transform the appearance of any room and provide you with essential storage space. 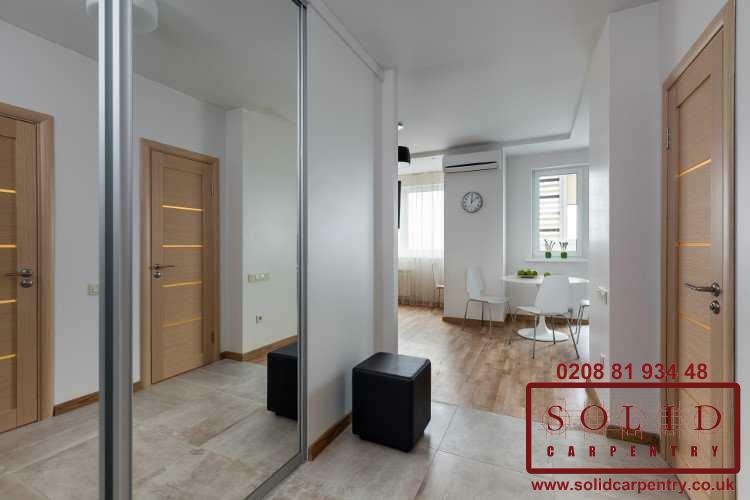 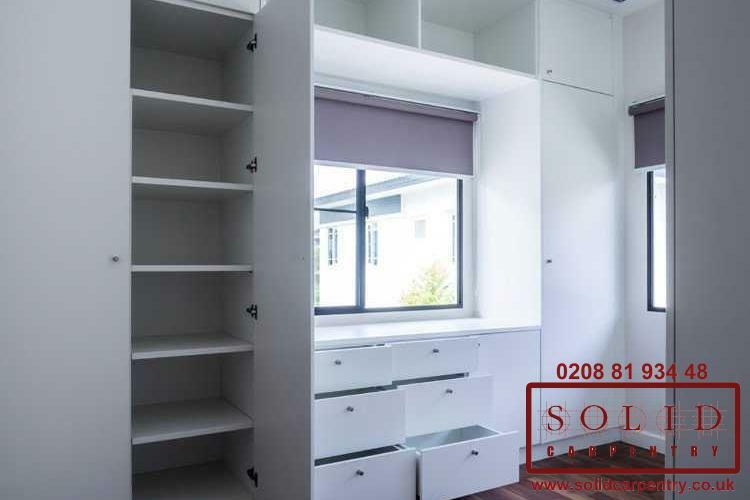 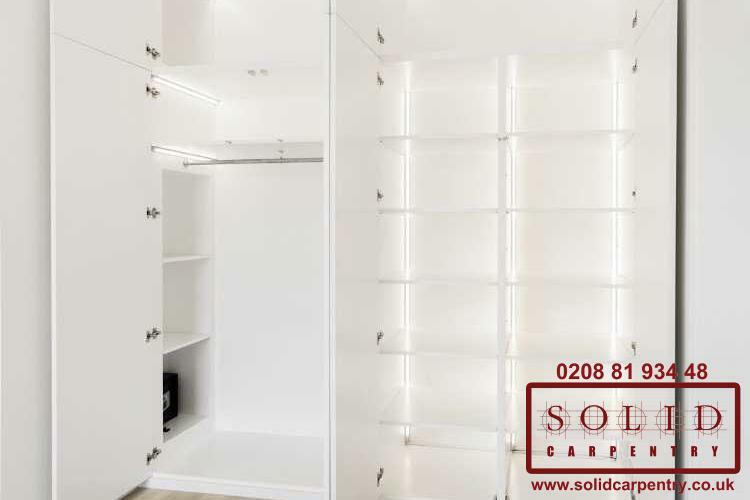 For properties with limited space or unconventional layouts, bespoke storage solutions offer a way to maximize on the space available, giving rooms a neater, fresher, more stylish look. 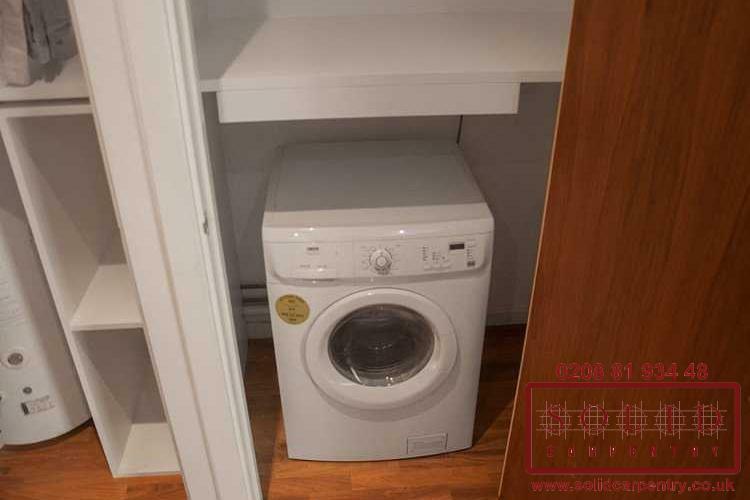 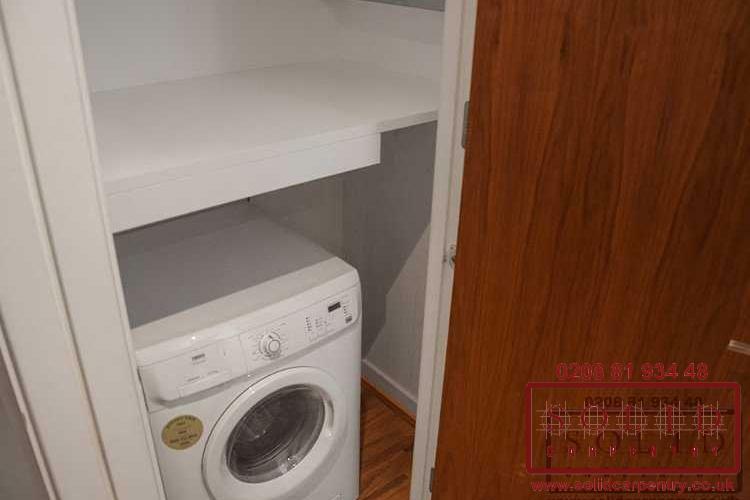 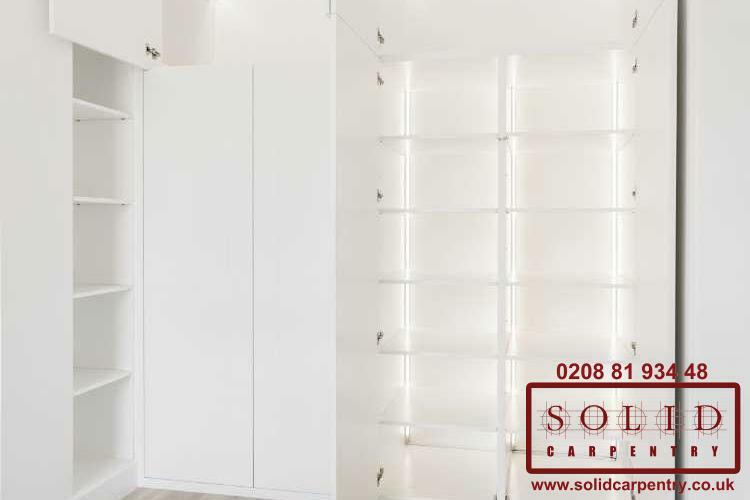 Even for properties with more traditional, less challenging layouts, fitted storage units offer creative and functional solutions that will refine and modernise any room. 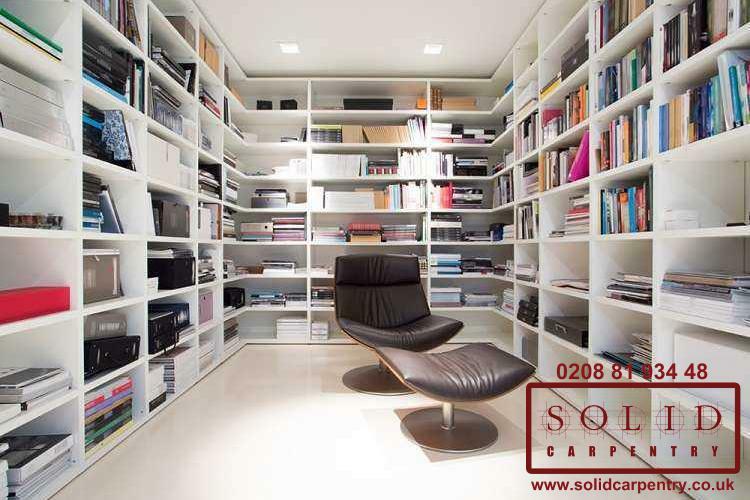 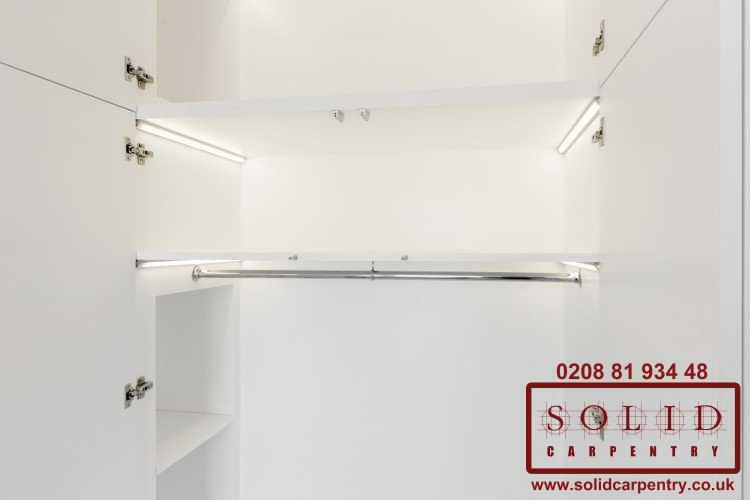 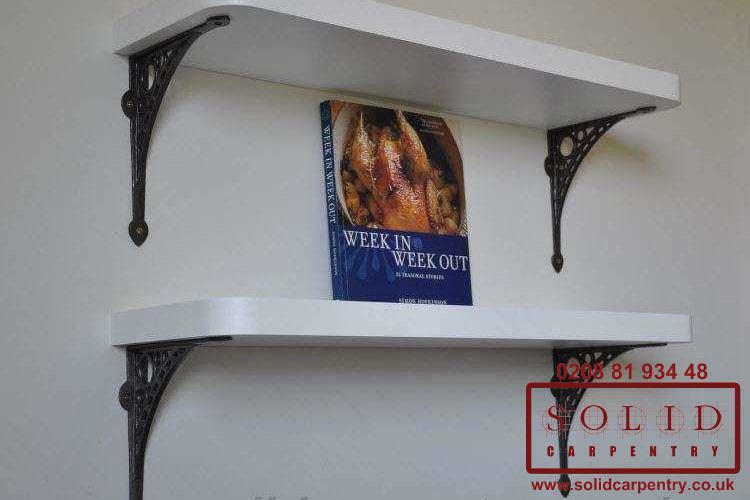 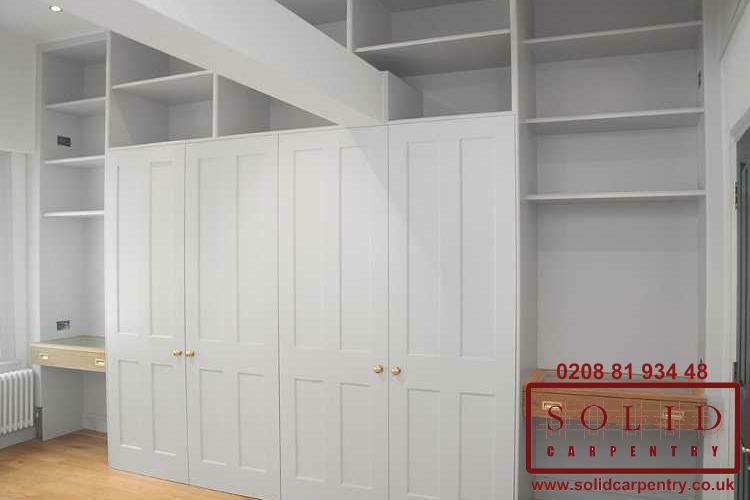 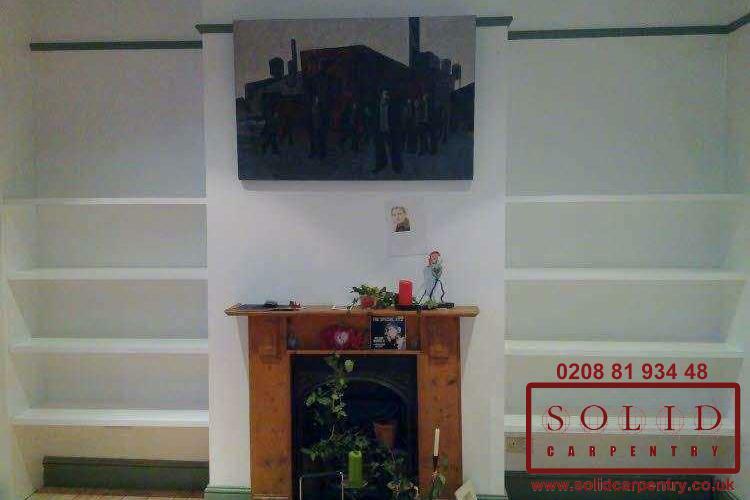 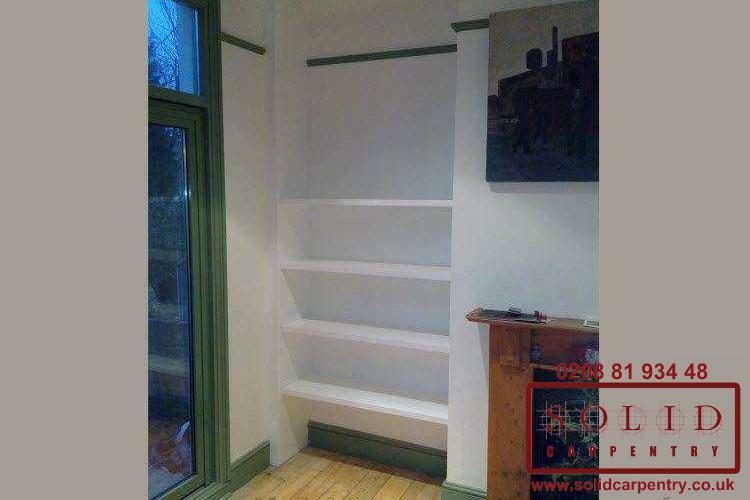 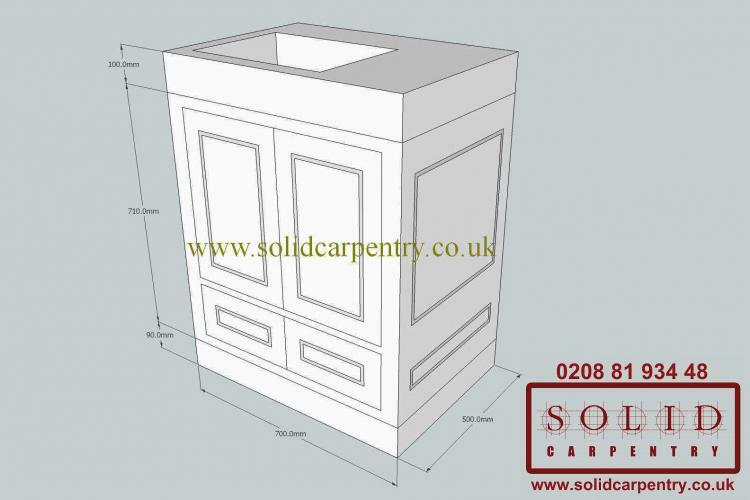 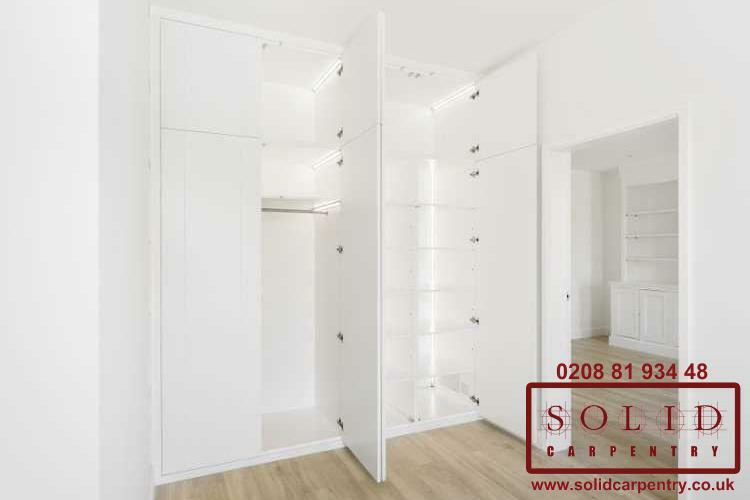 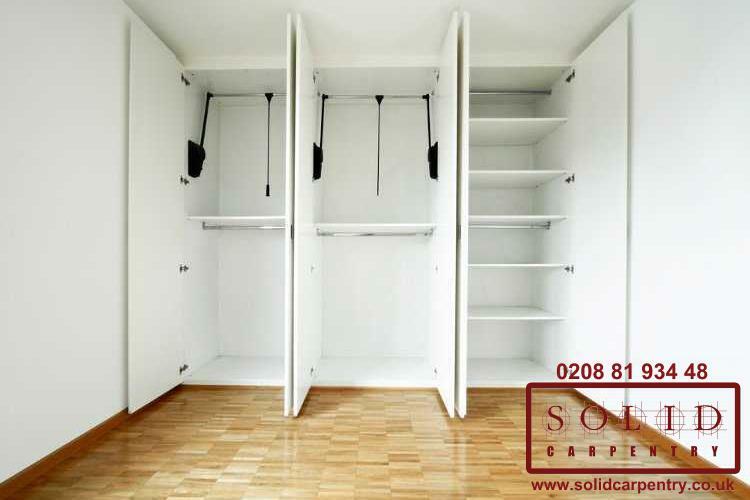 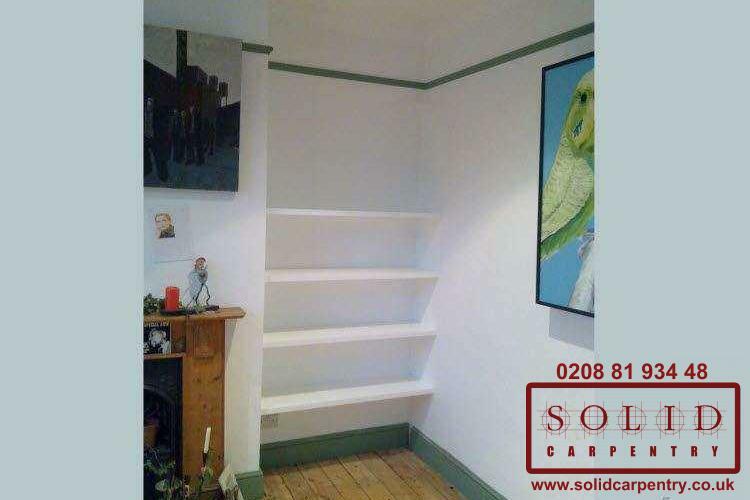 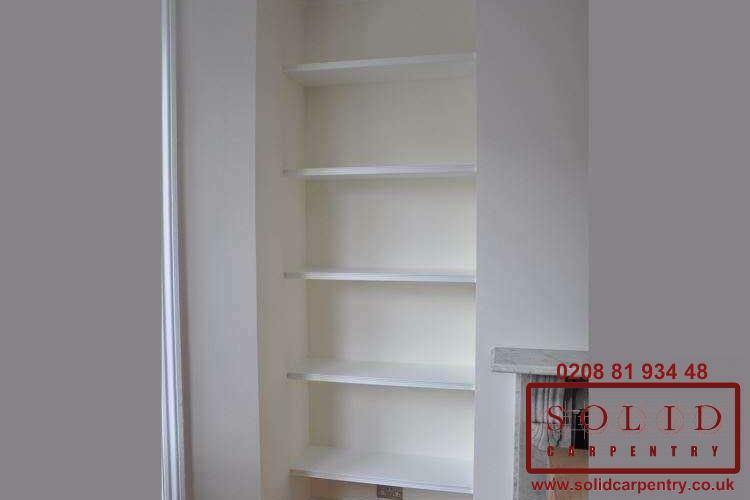 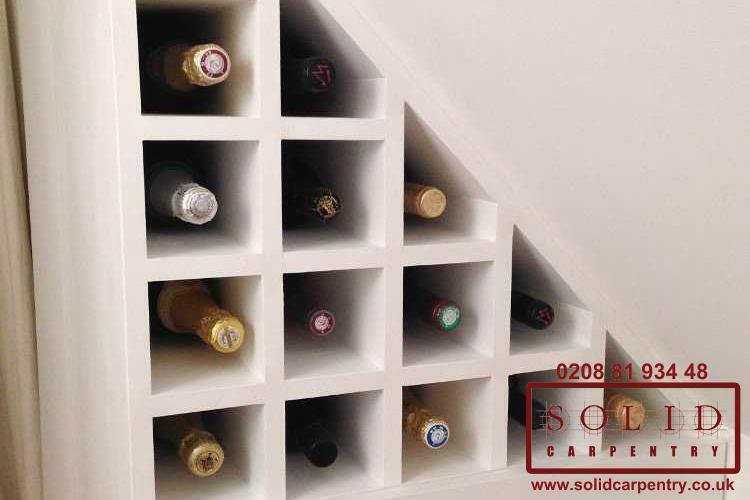 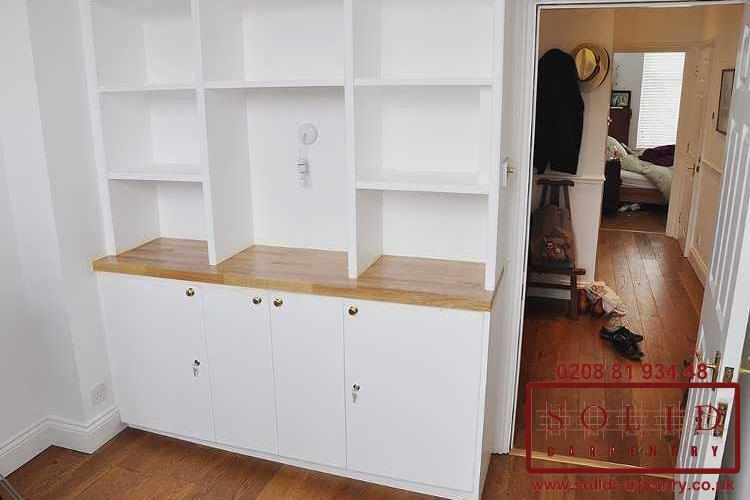 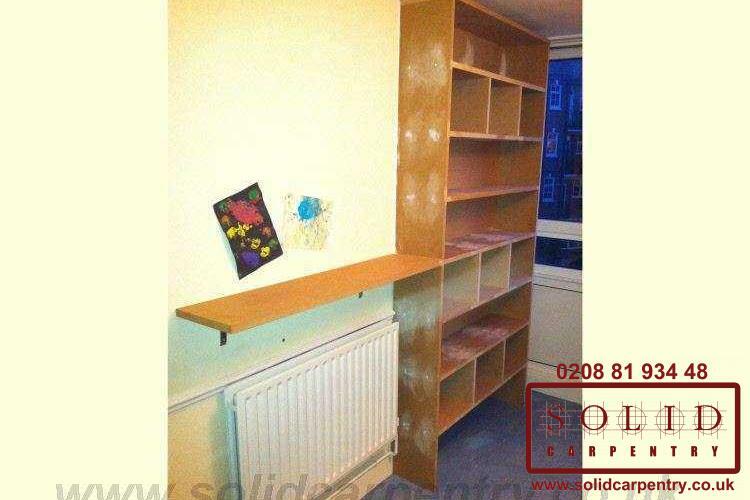 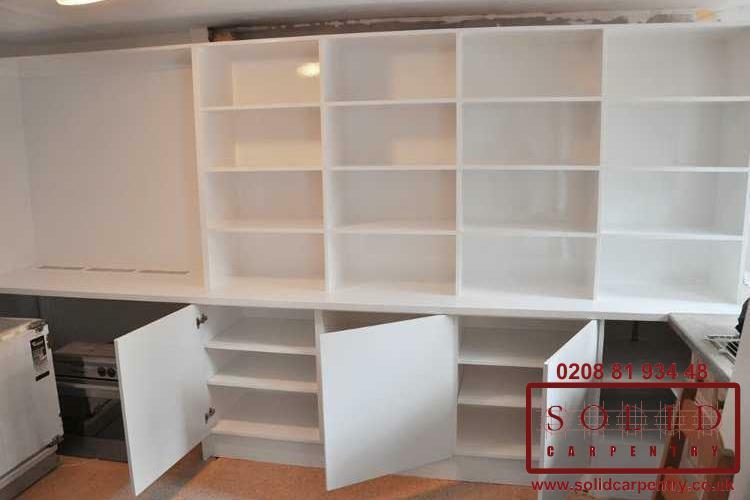 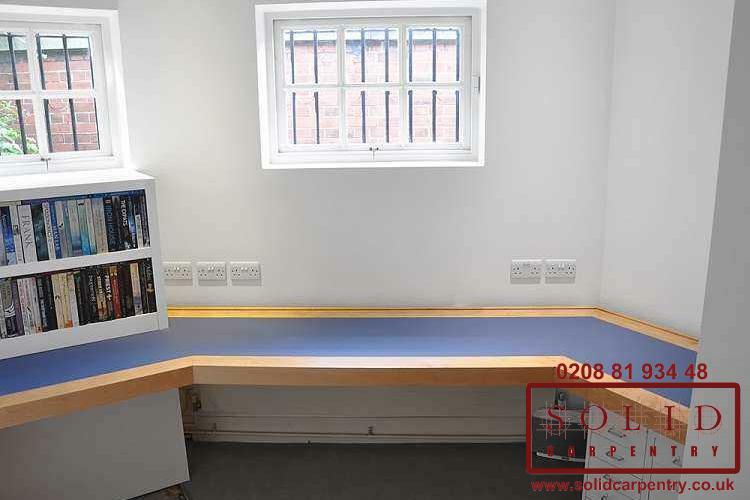 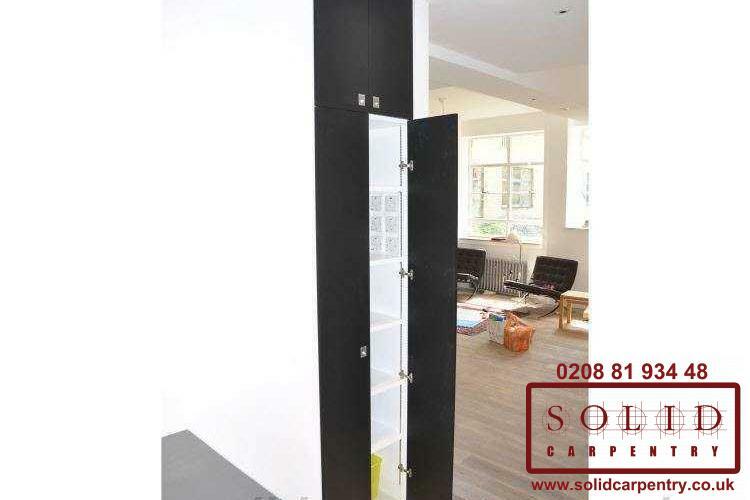 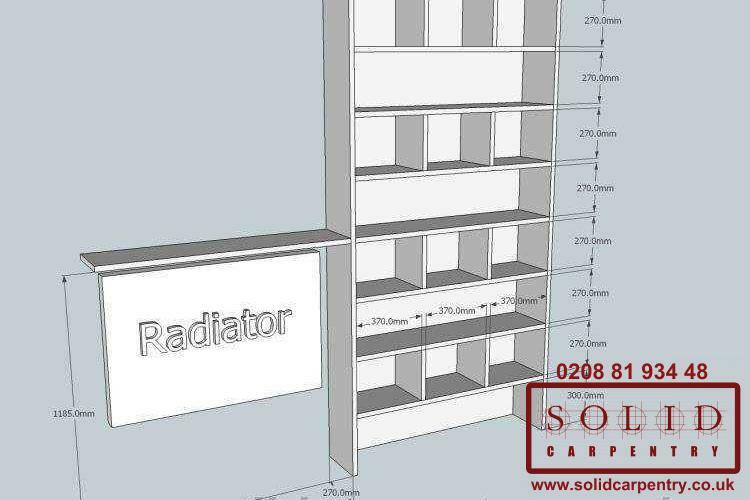 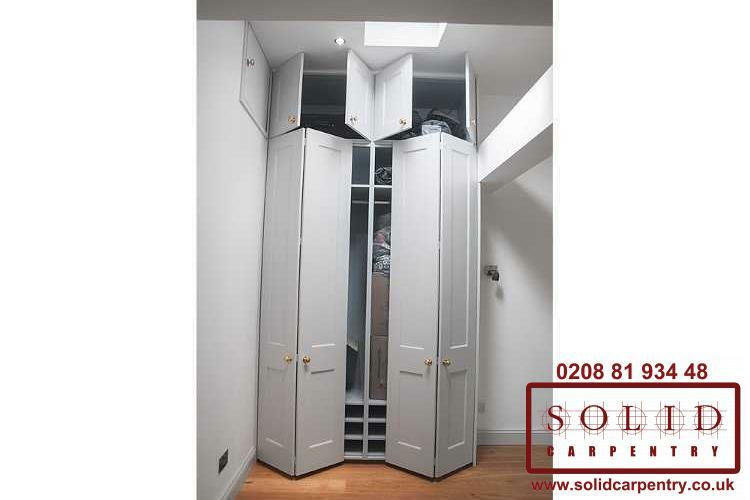 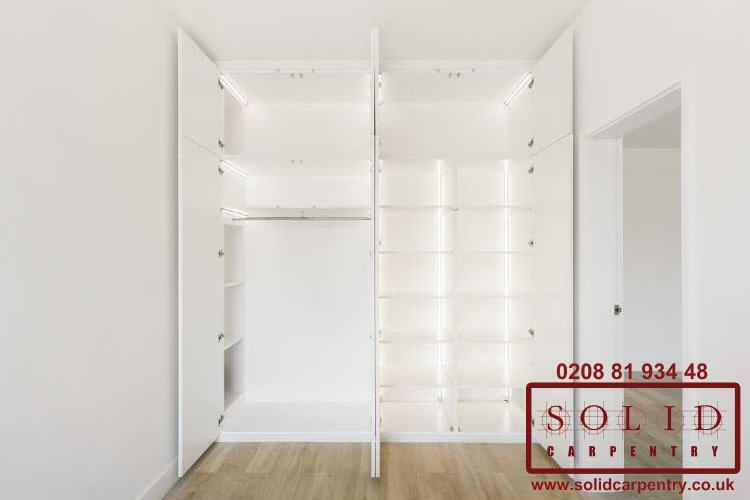 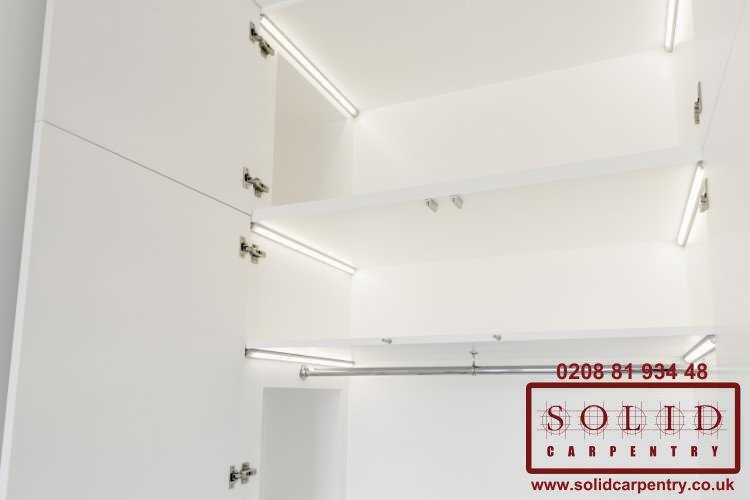 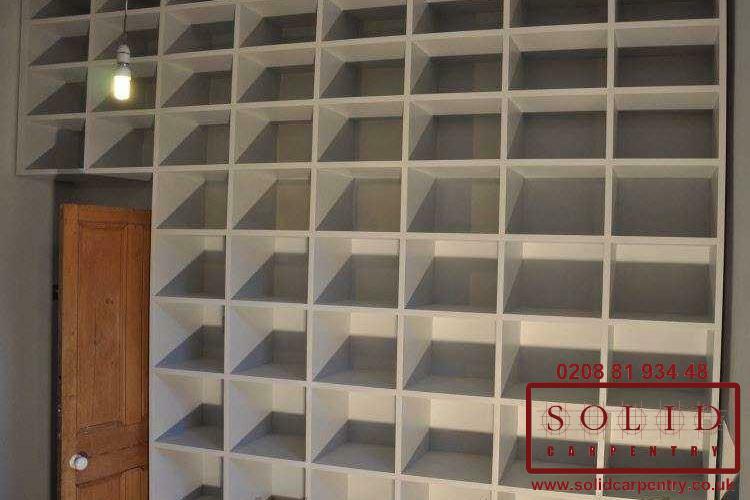 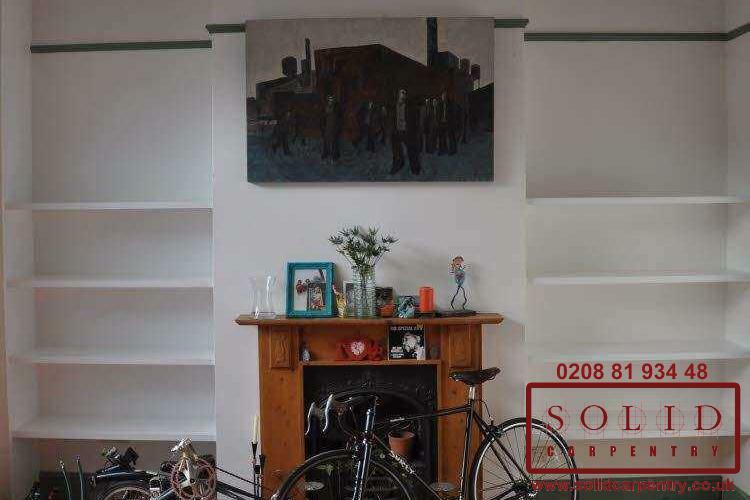 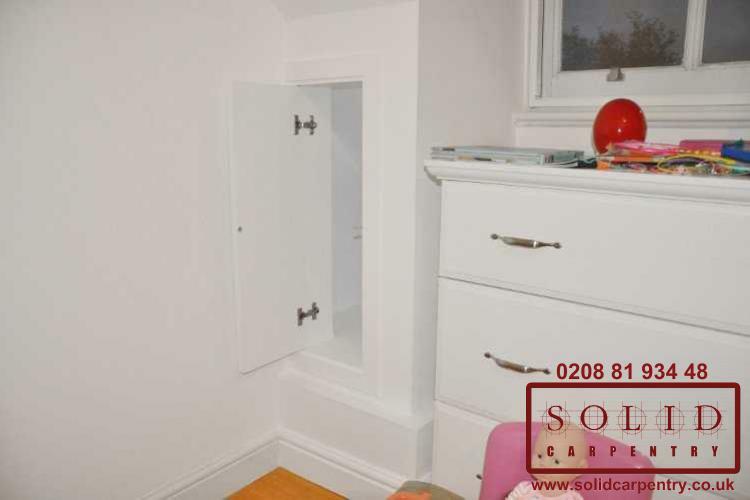 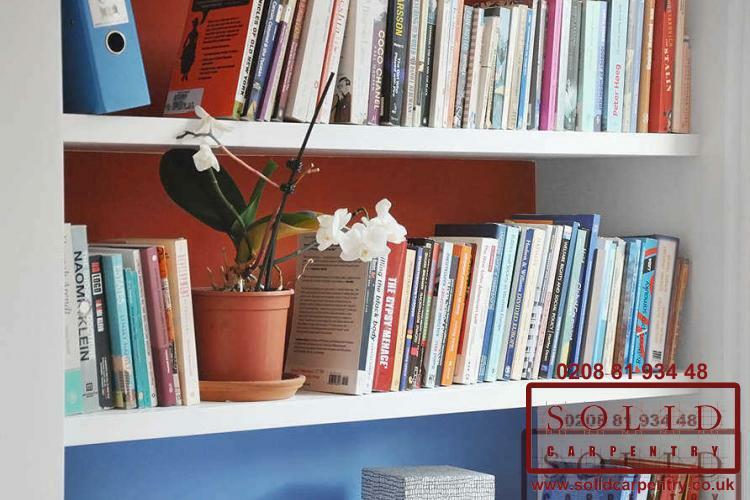 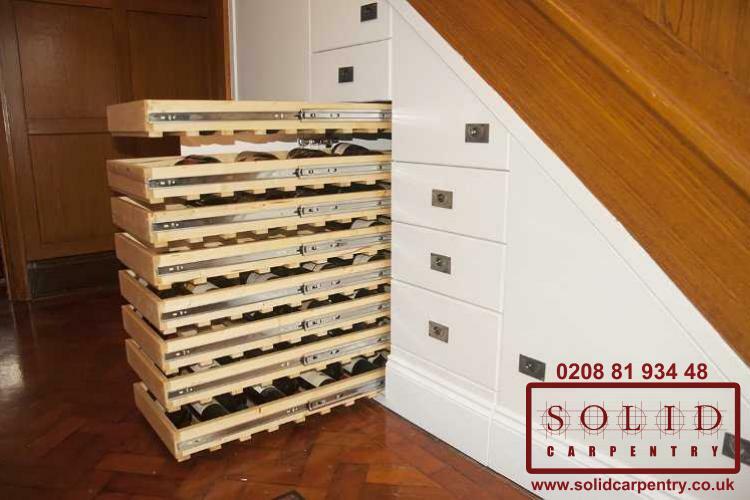 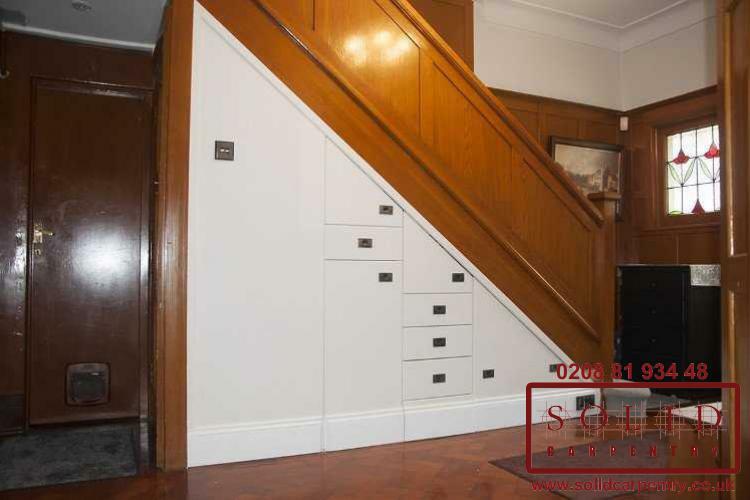 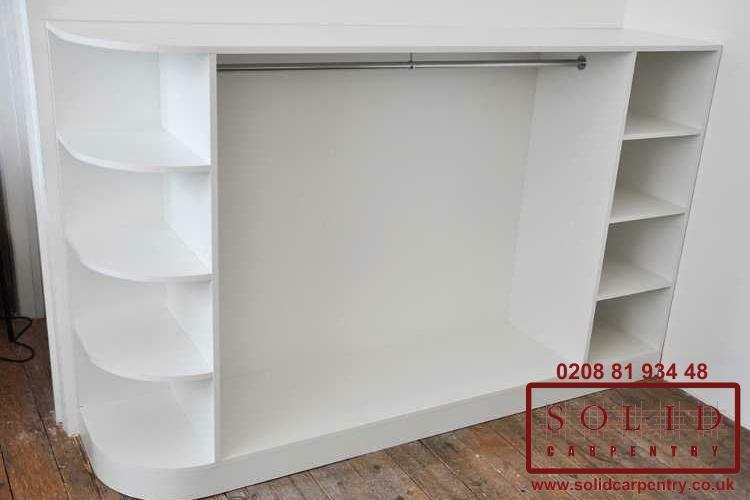 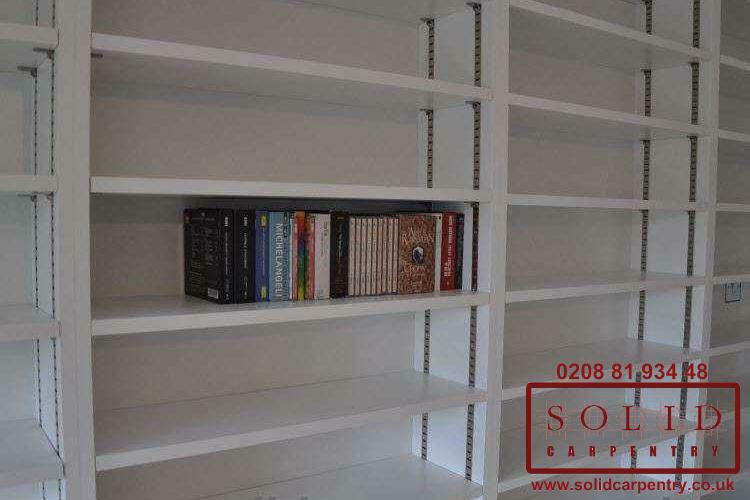 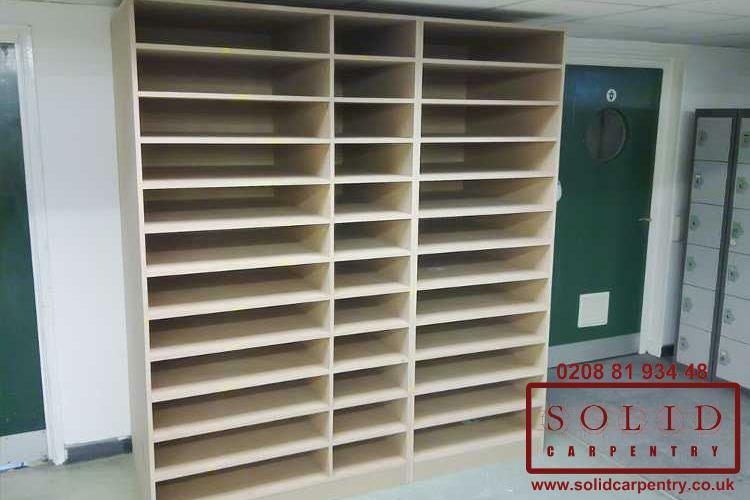 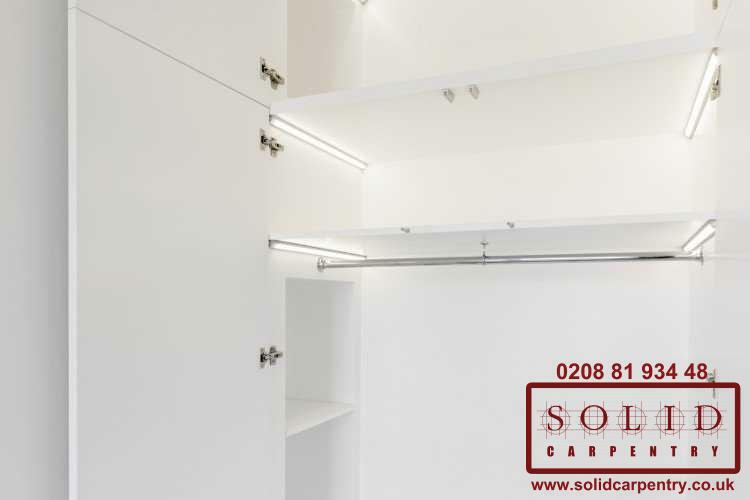 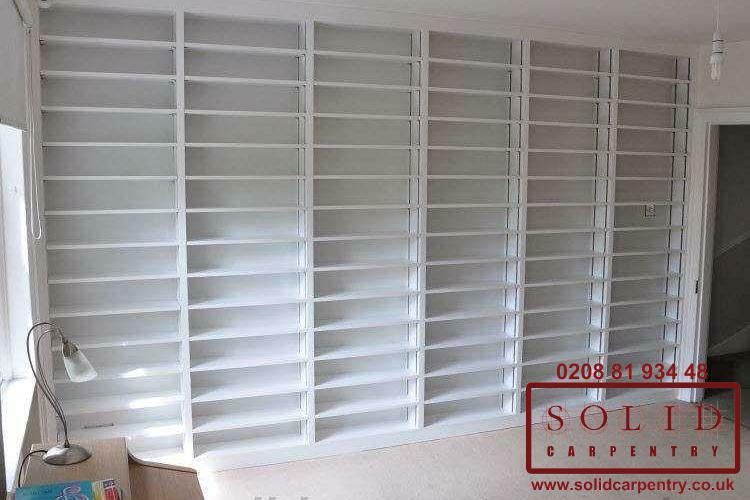 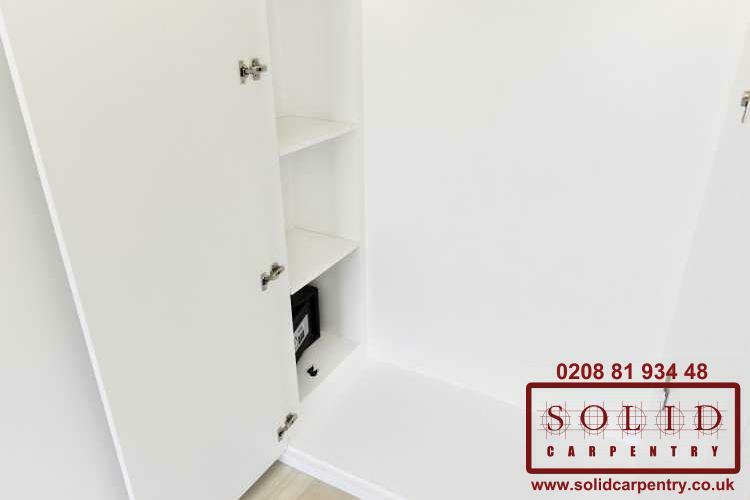 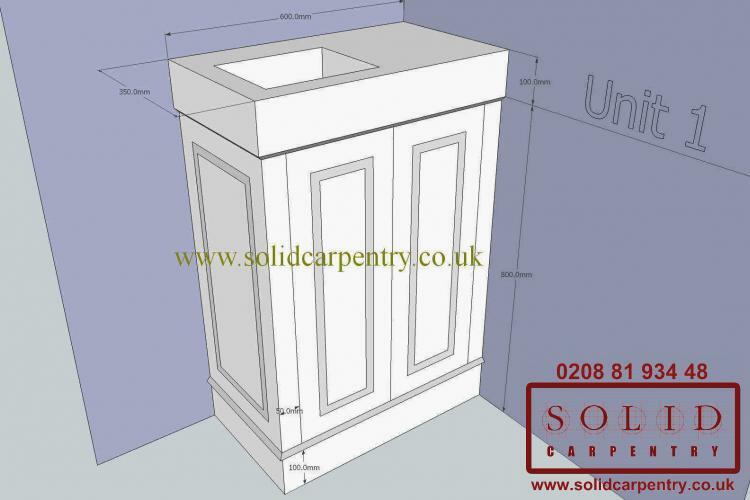 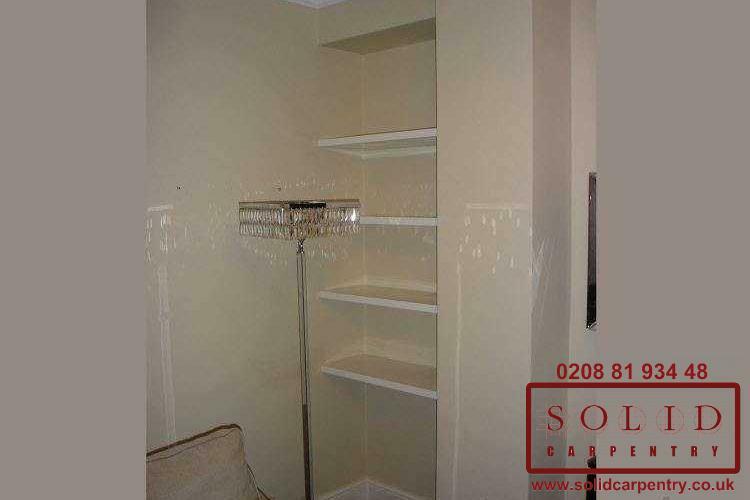 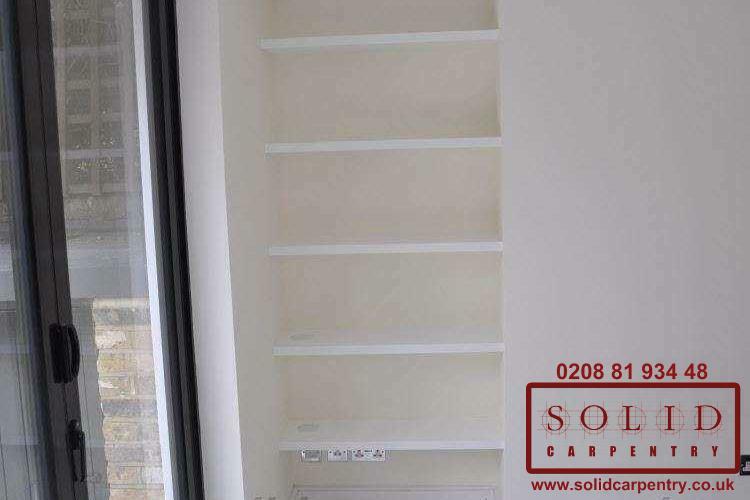 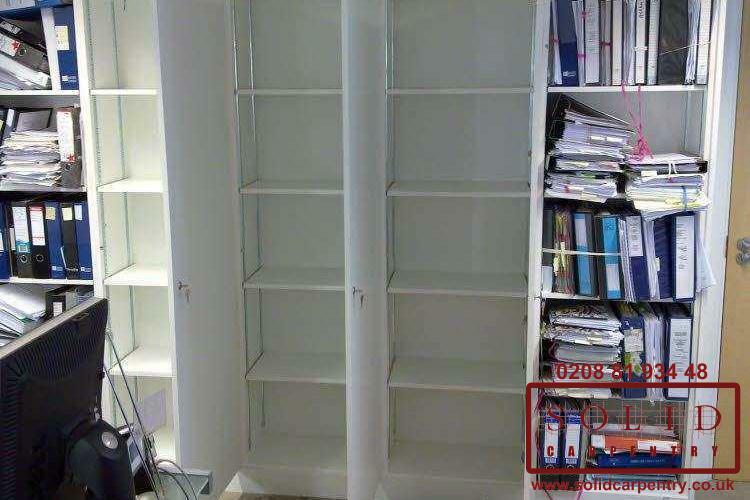 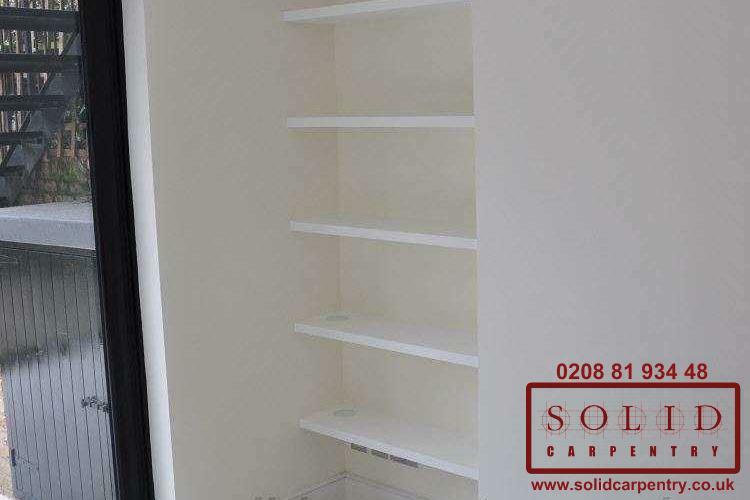 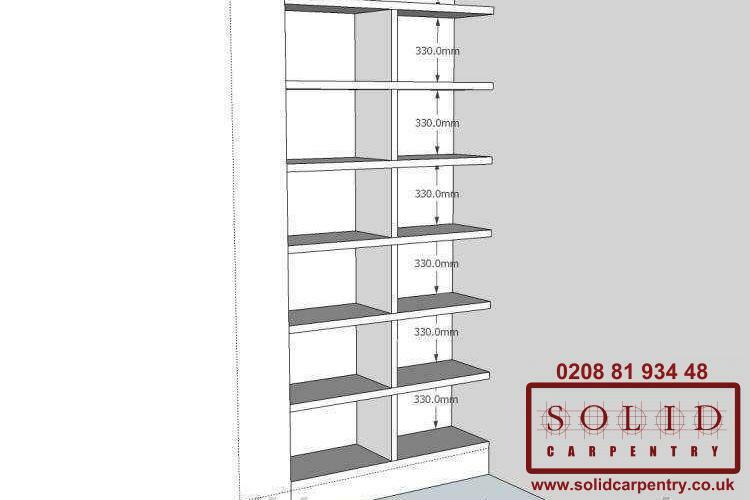 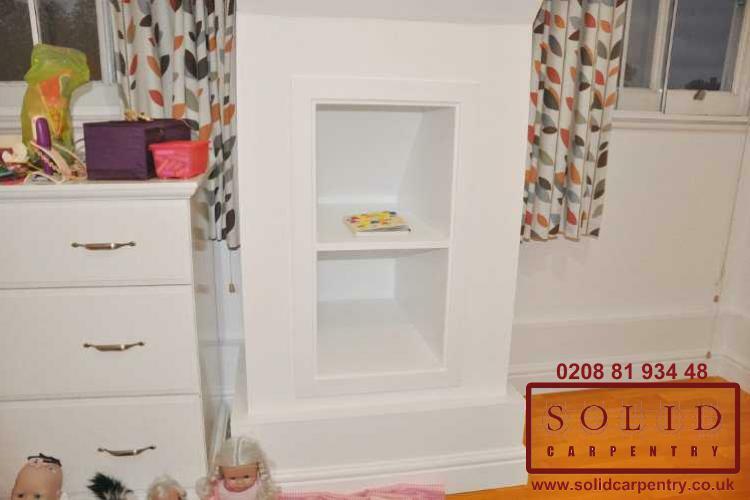 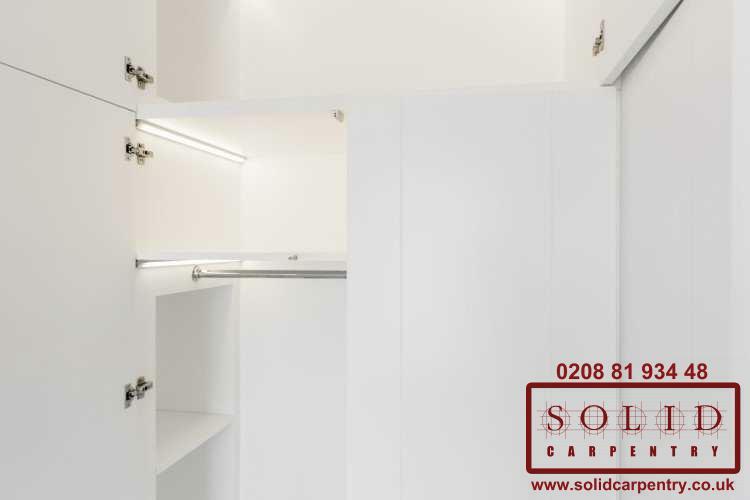 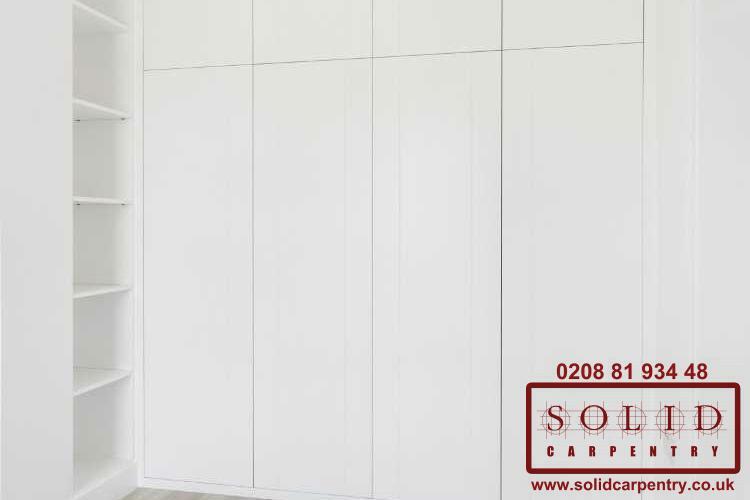 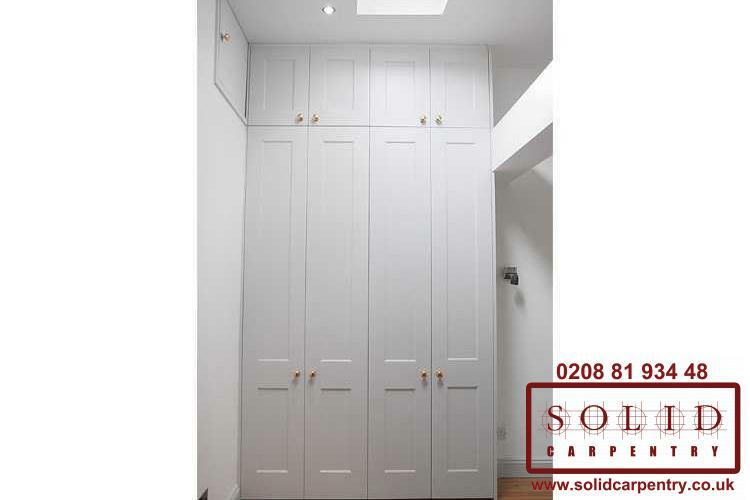 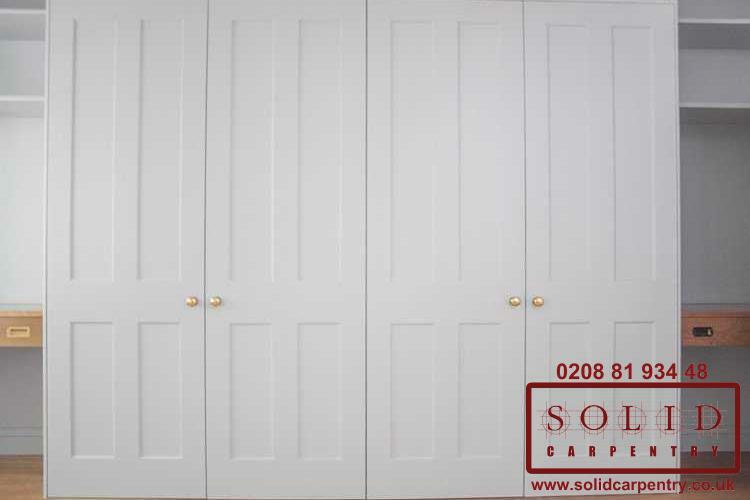 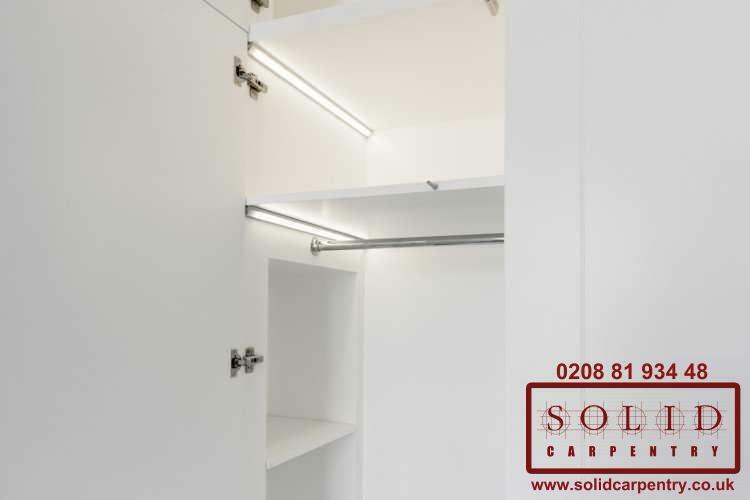 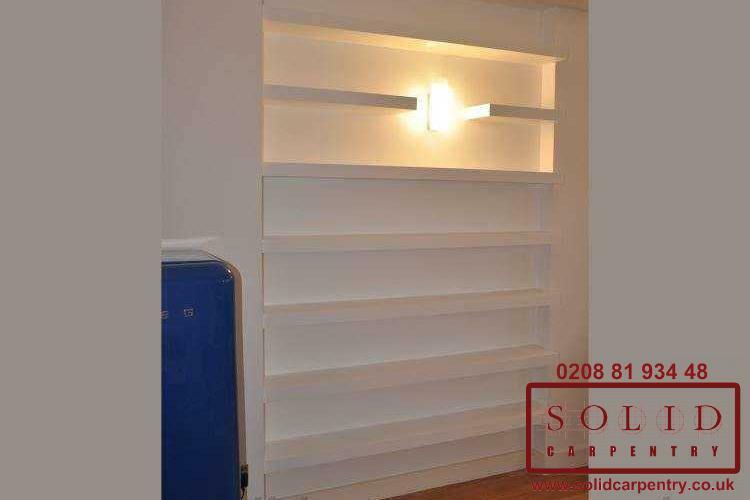 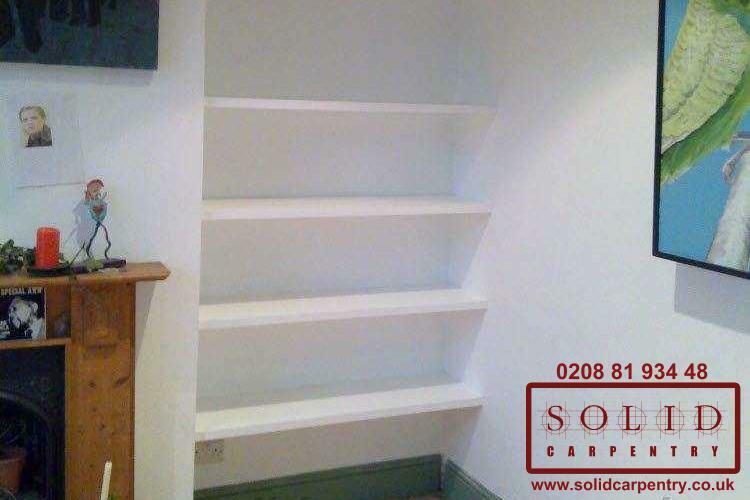 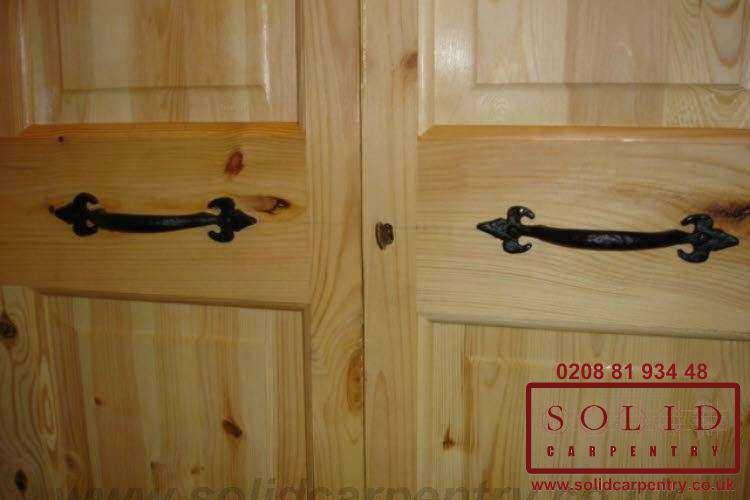 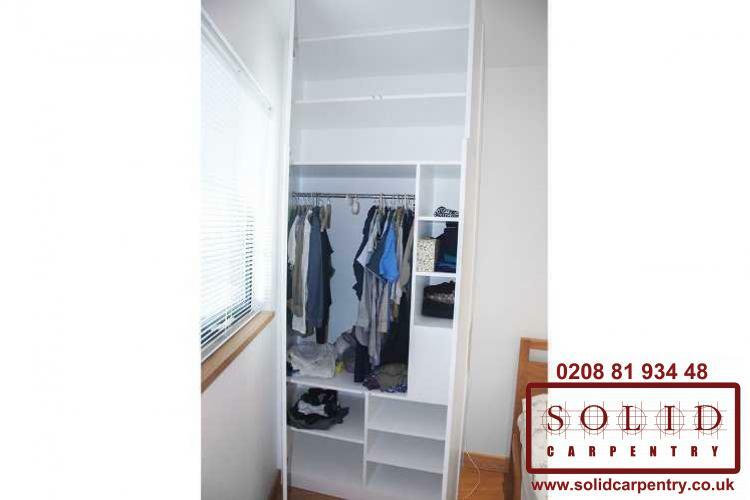 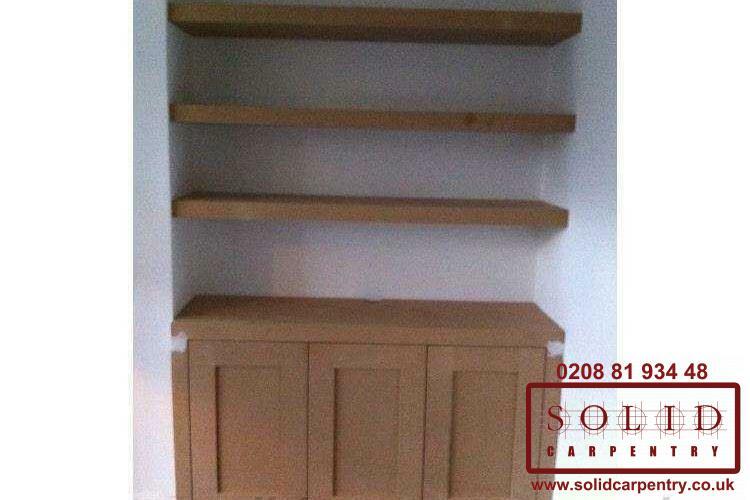 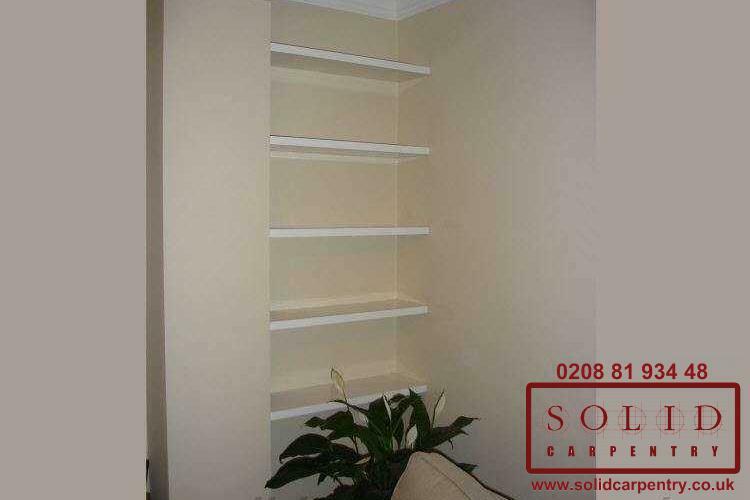 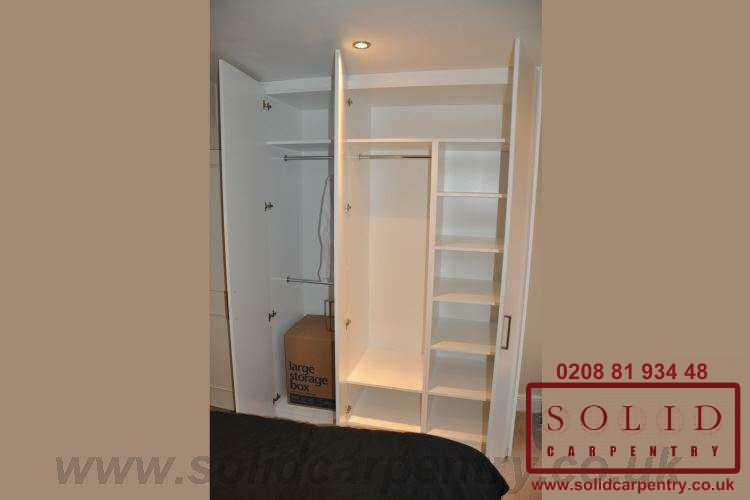 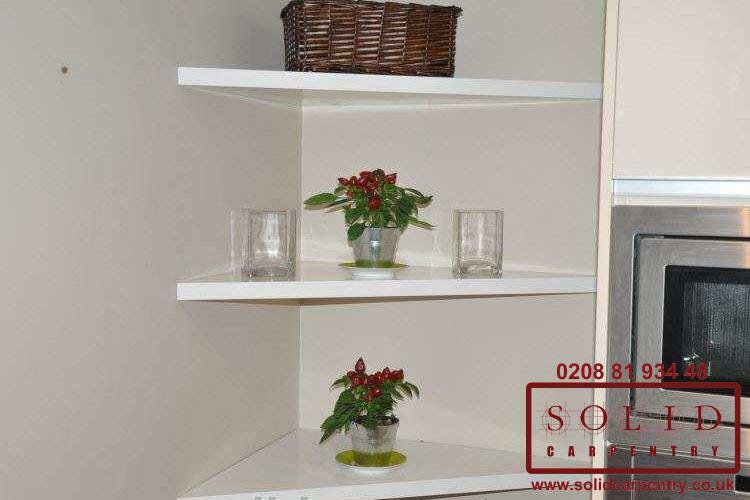 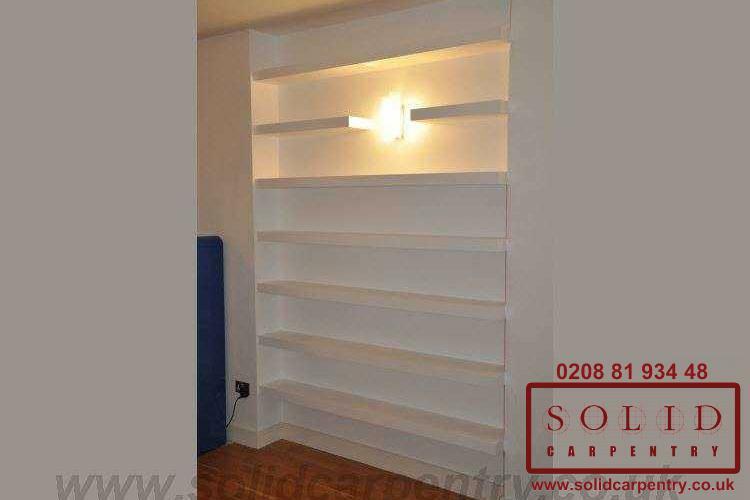 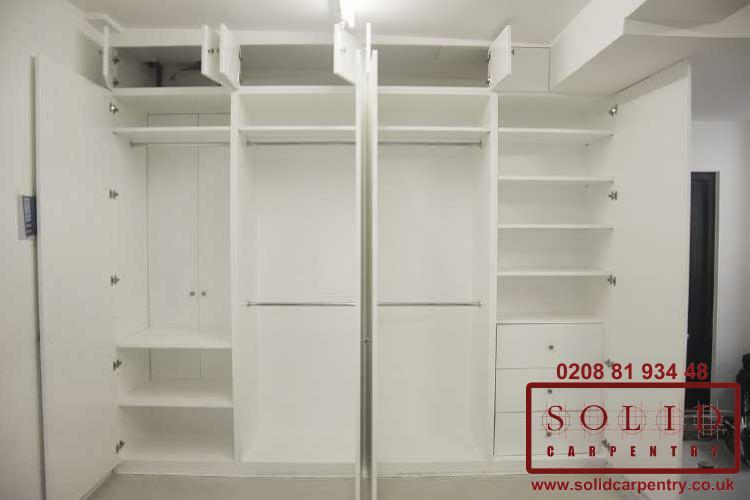 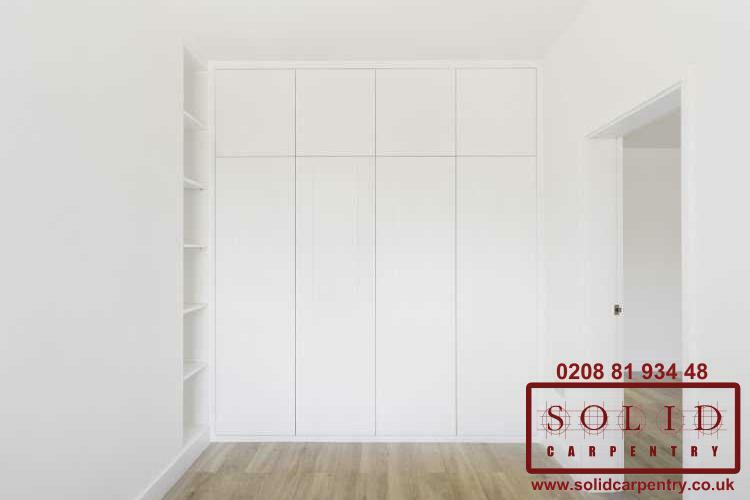 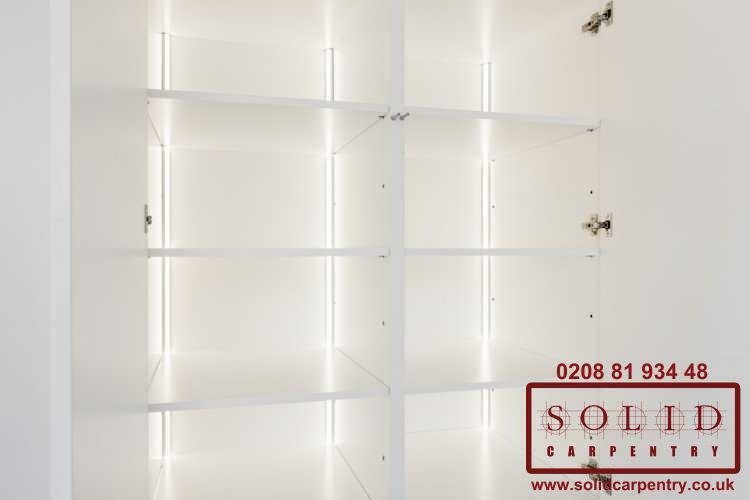 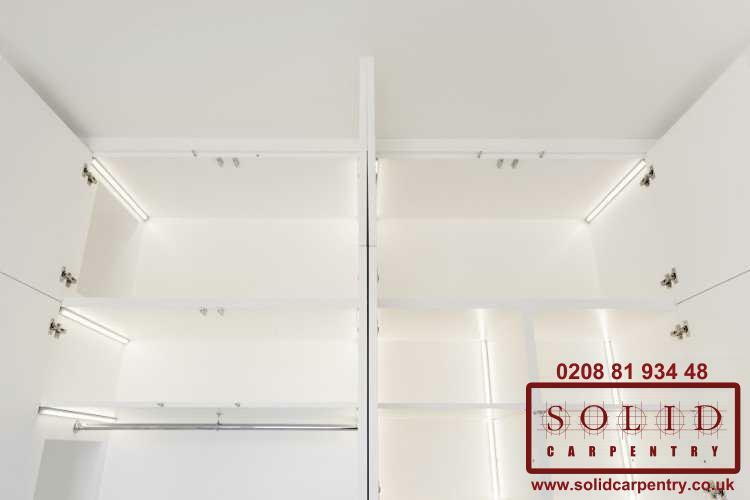 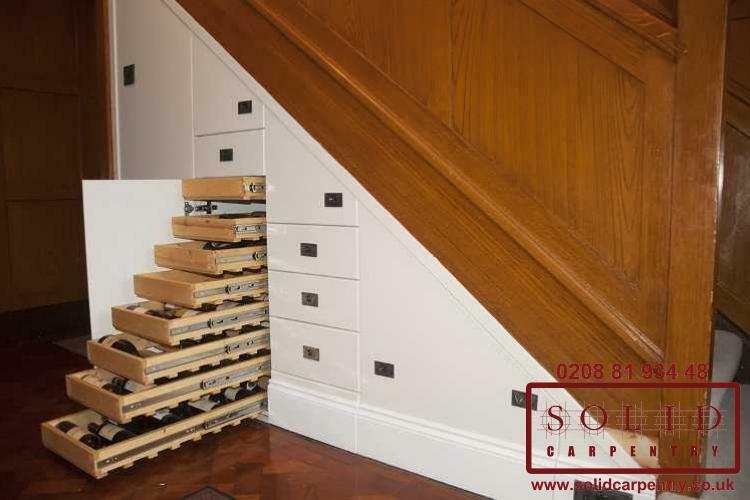 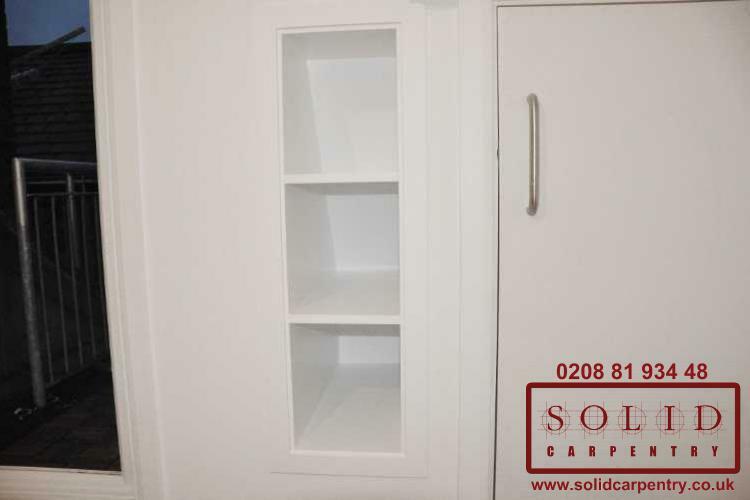 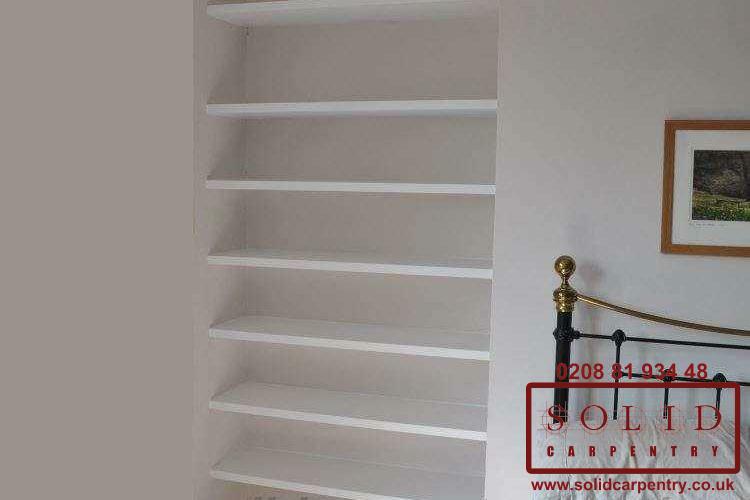 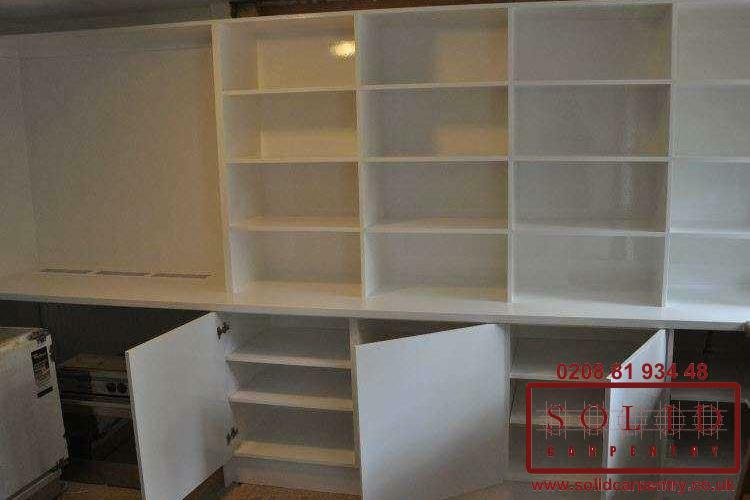 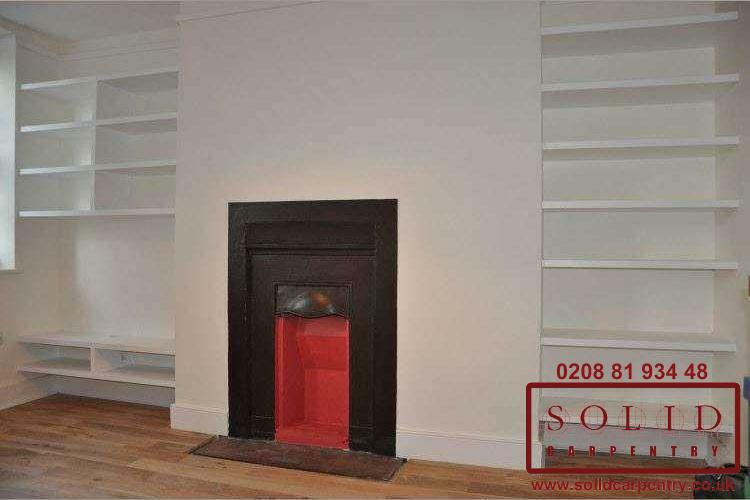 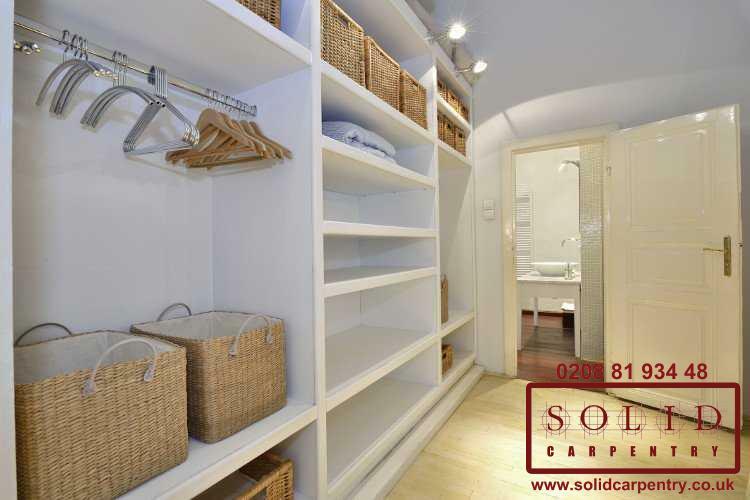 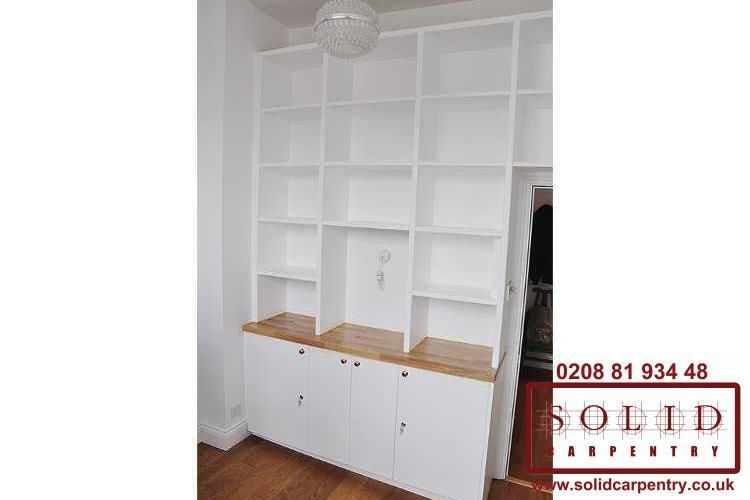 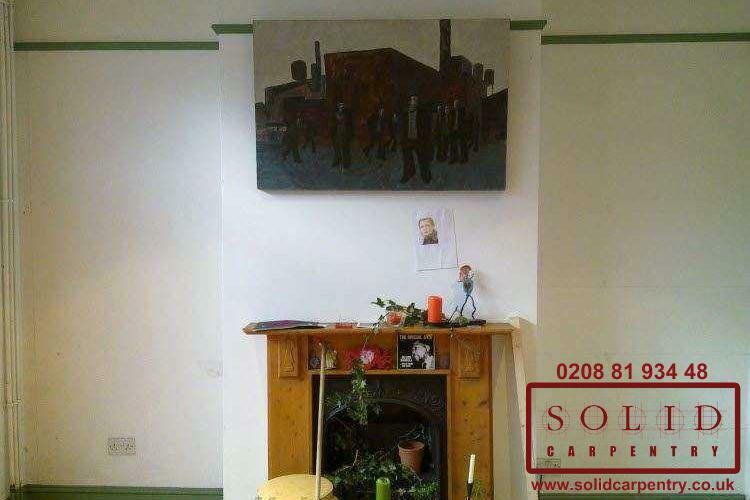 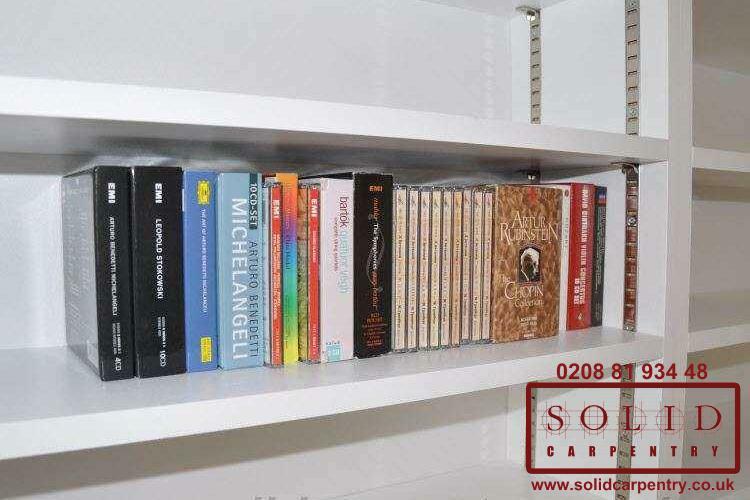 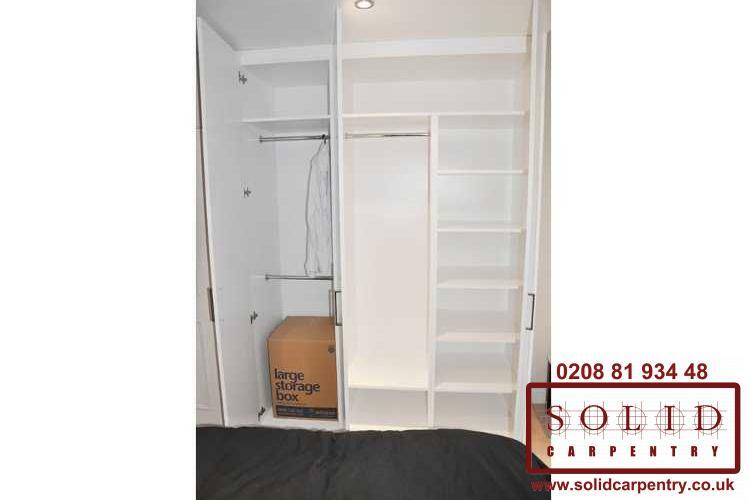 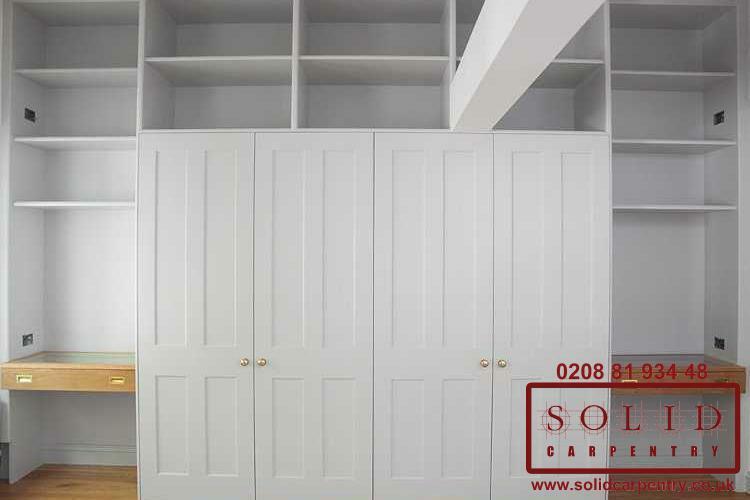 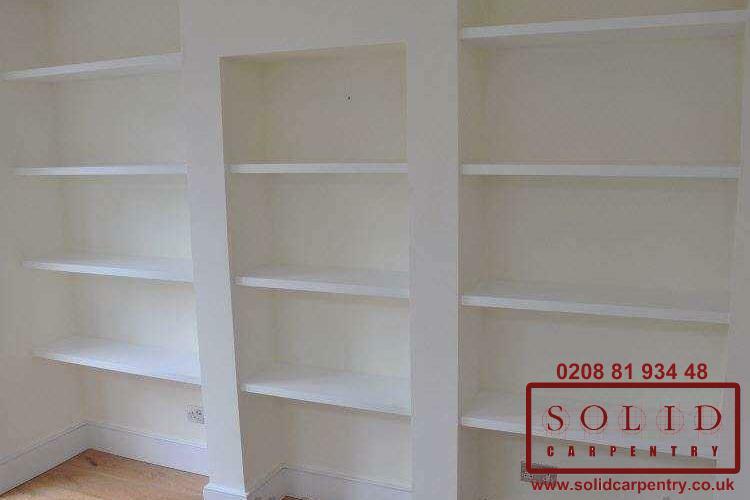 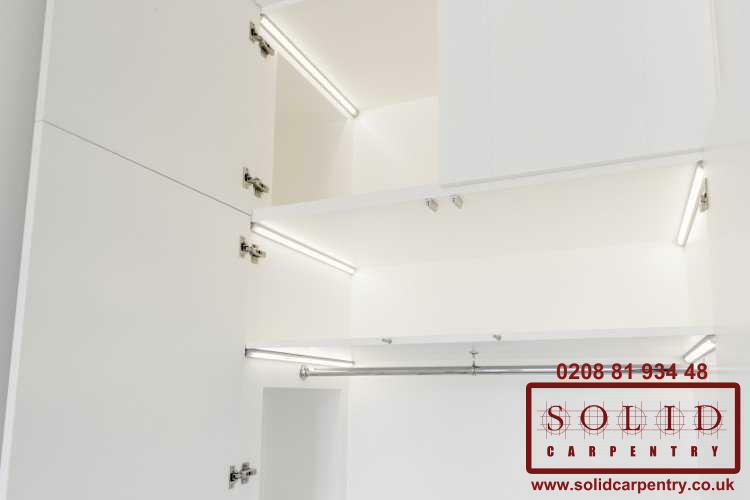 At Solid Carpentry, we can smartly design a wide range of bespoke fitted storage units including handy built-in cupboards and cabinets; beautifully robust bookcases; alcove, floating, and traditional shelving; home libraries; and much more. 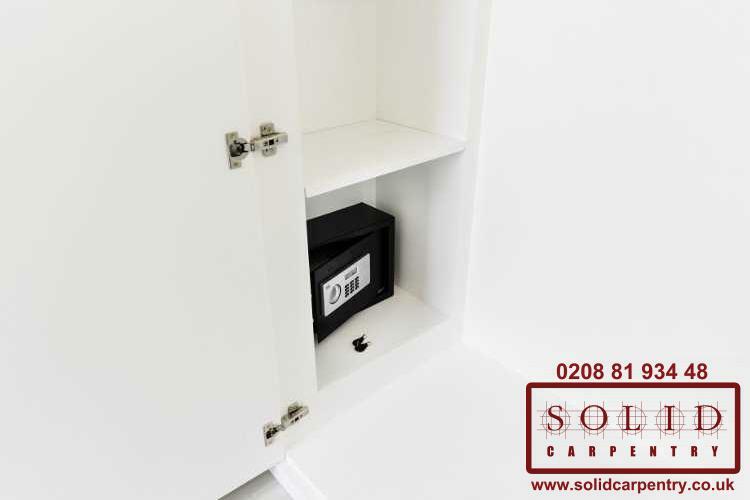 Whatever your storage requirement, we can build and install your fitted unit to your exact specifications. 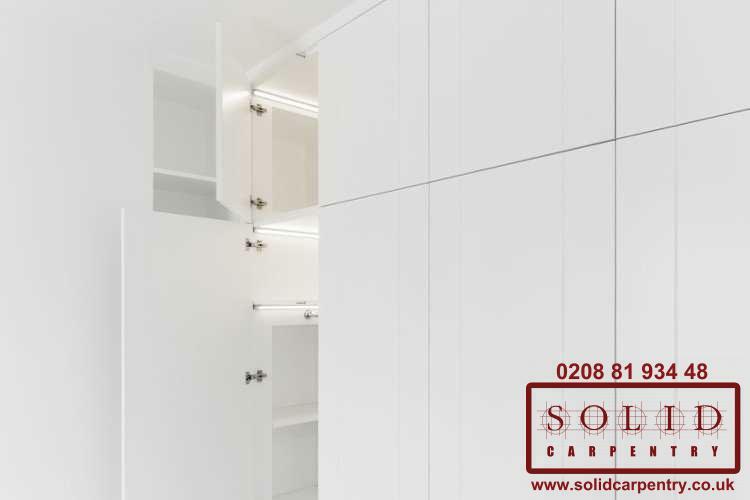 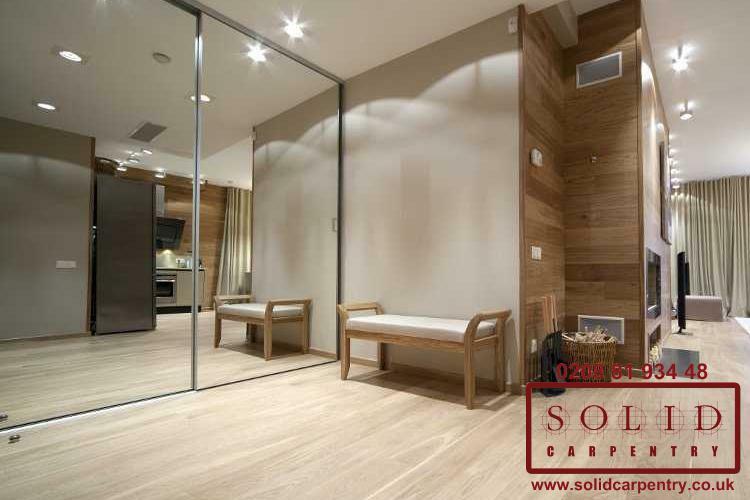 Our carpenters will work closely with you from the beginning of the process: from design to installation. 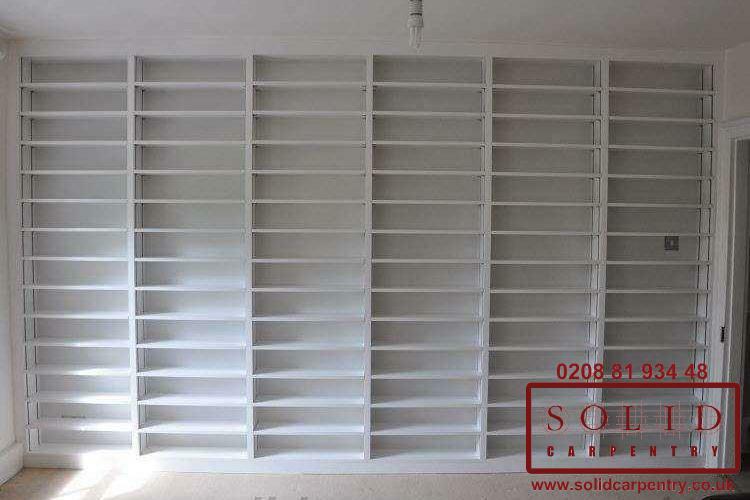 Whether you want to take advantage of an empty recess by adding a bespoke shelving unit, tidy up a children’s bedroom with a custom-built bookcase, or incorporate a range of fitted storage cabinets to your living room, we will work alongside you to customise a final product that adds value and style to your space. 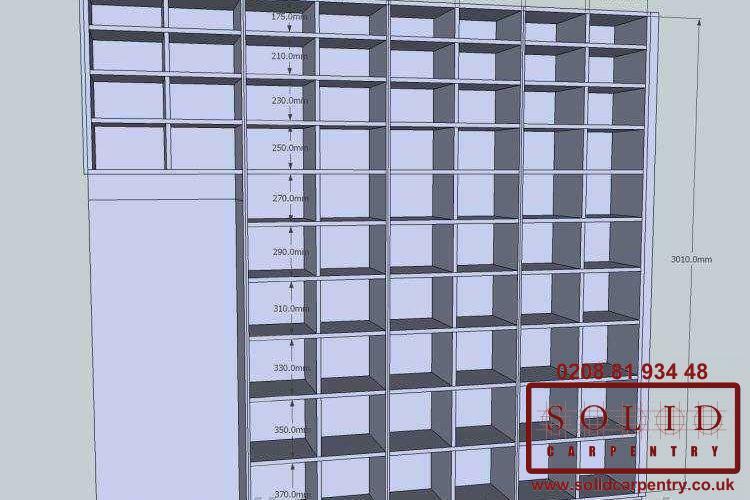 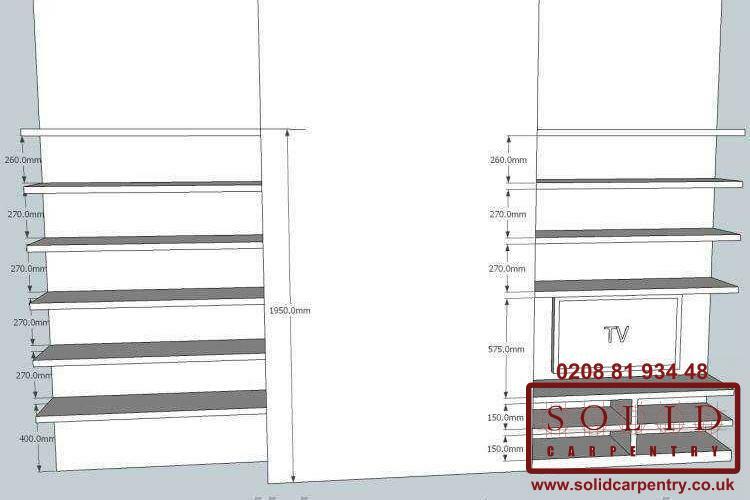 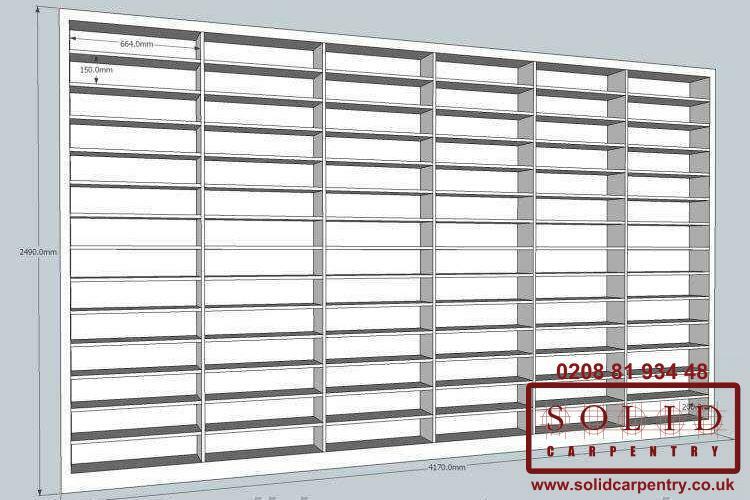 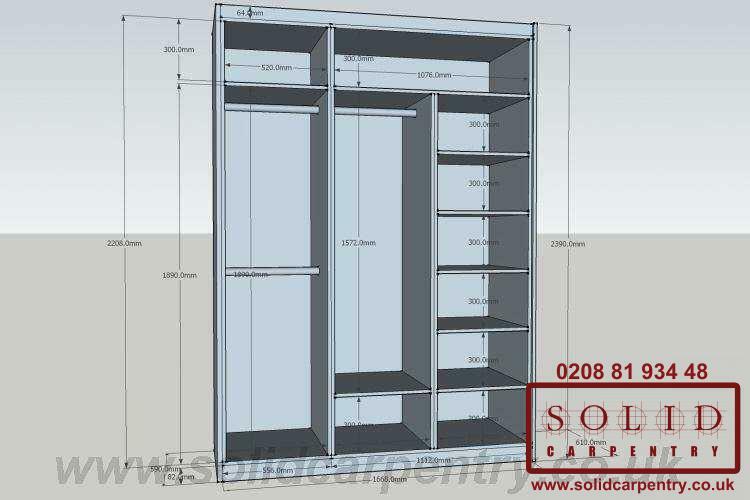 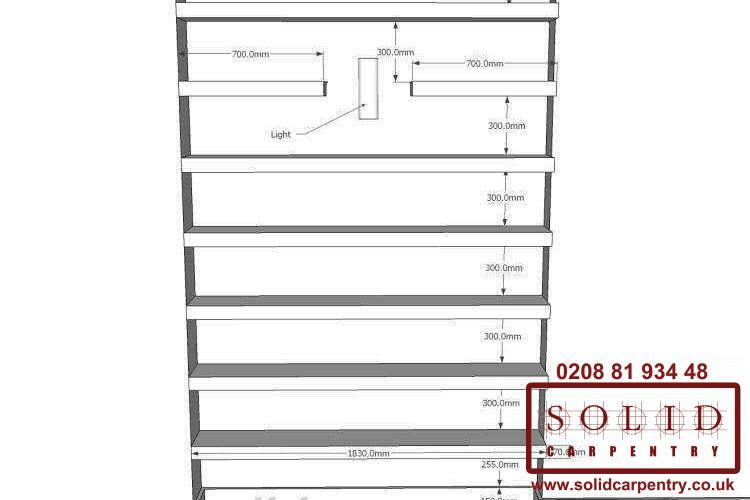 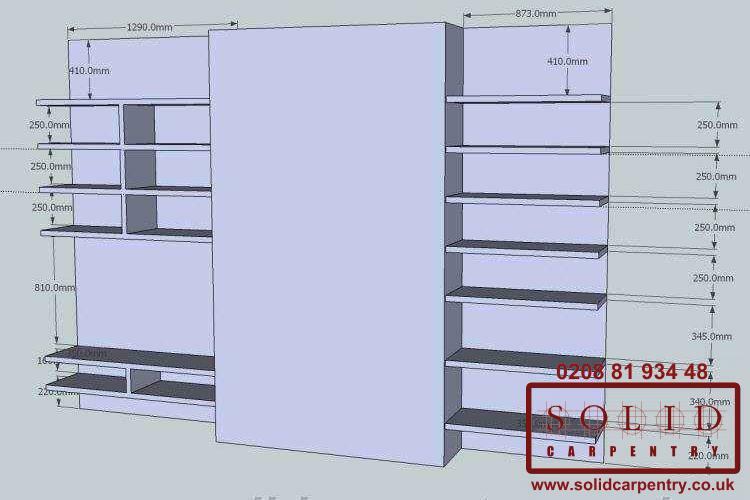 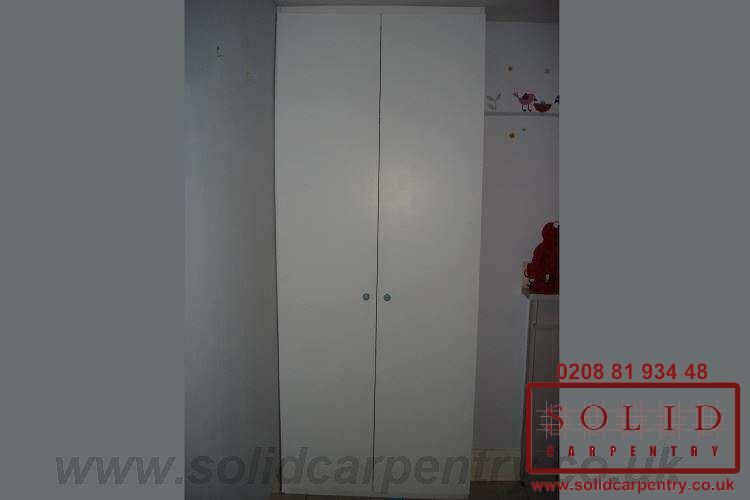 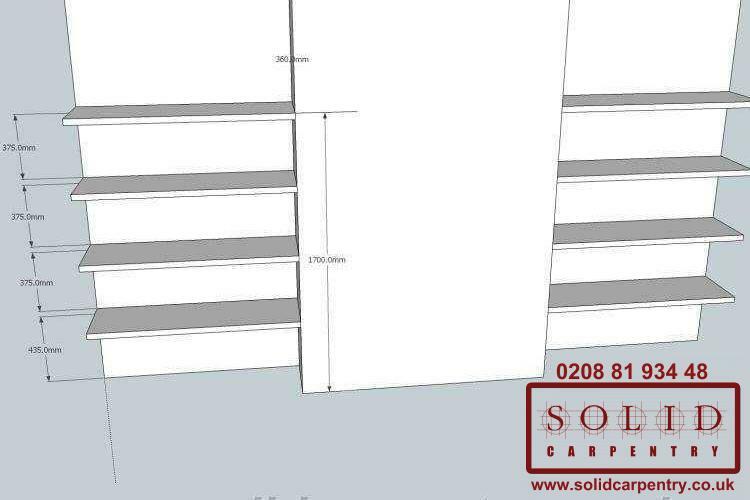 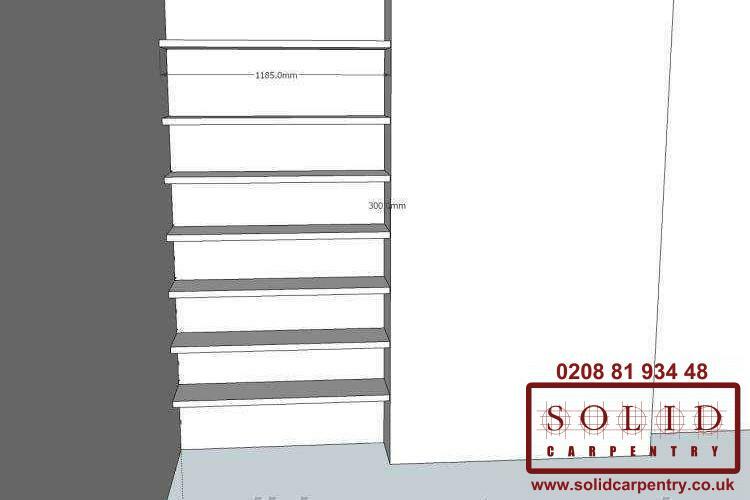 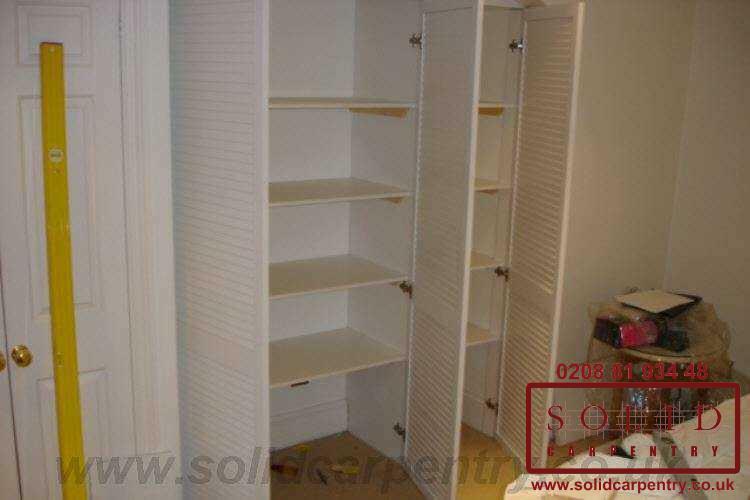 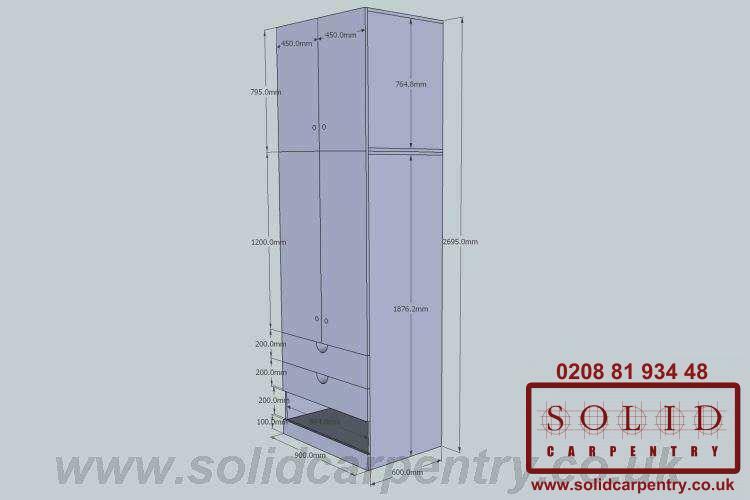 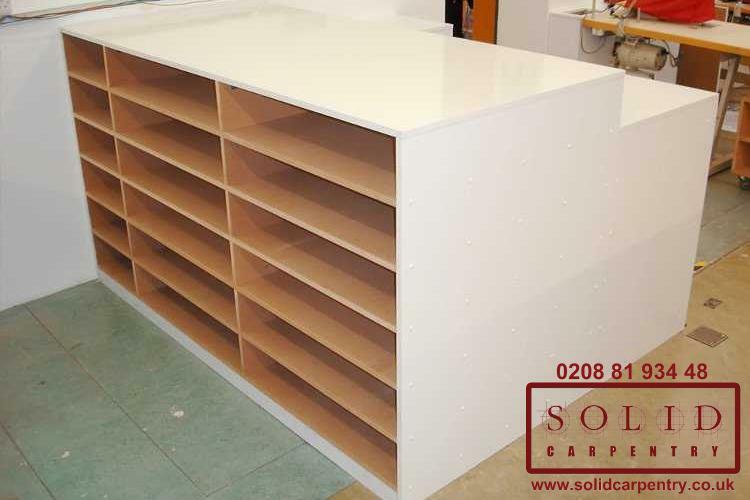 We can build your custom storage units to any width, depth, height, colour or other requirement. 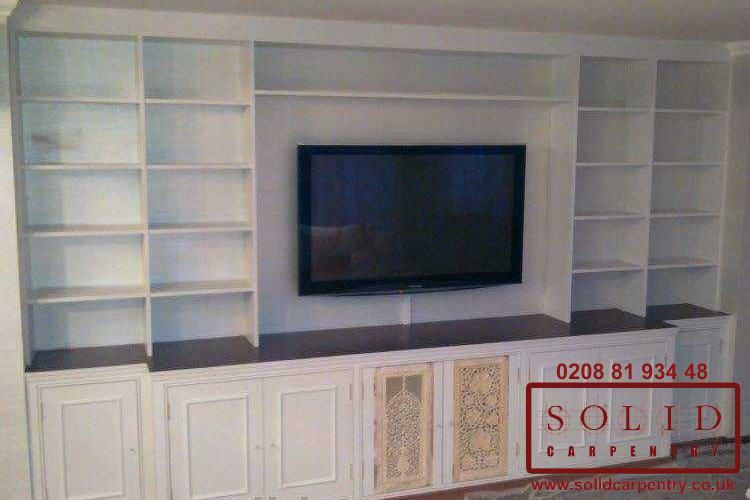 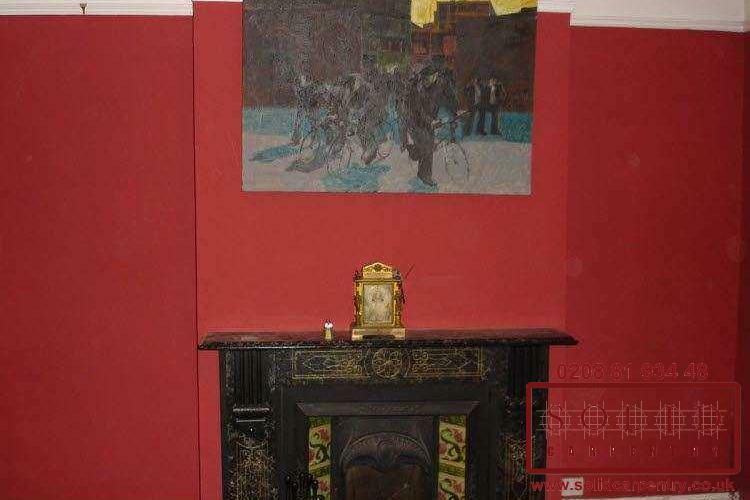 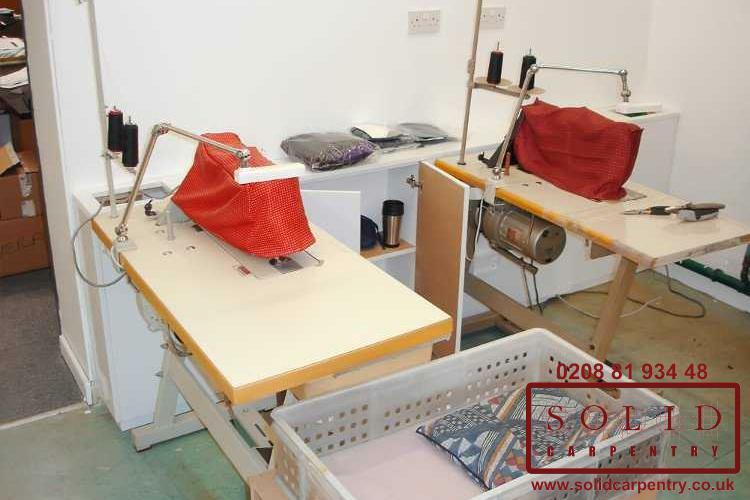 We have many years’ experience creating custom-built furniture for rooms of all shapes and sizes. 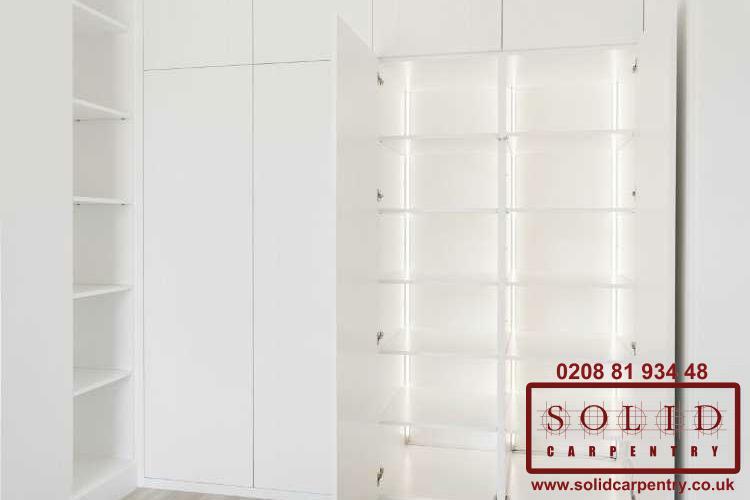 We have, therefore, become experts in installing and designing bespoke storage solutions, providing our customers with a sophisticated and well-organised home or office space. 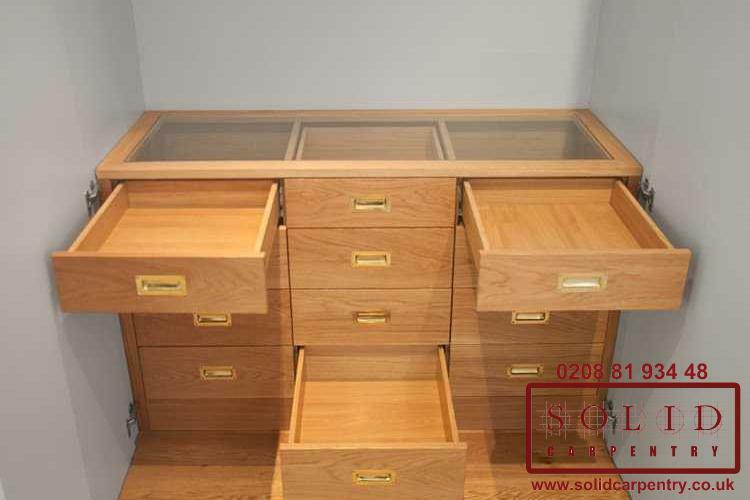 We will also help you to choose from a variety of high-quality materials, beautiful wood coatings, and elegant stains to create a final product that enhances your home or office for many years to come. 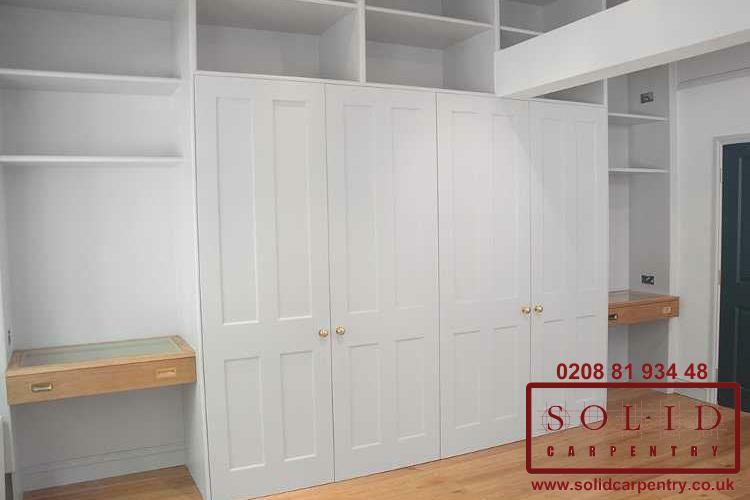 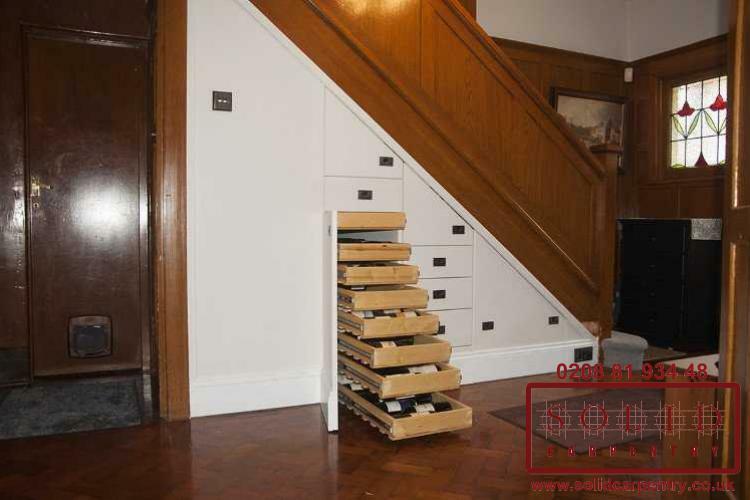 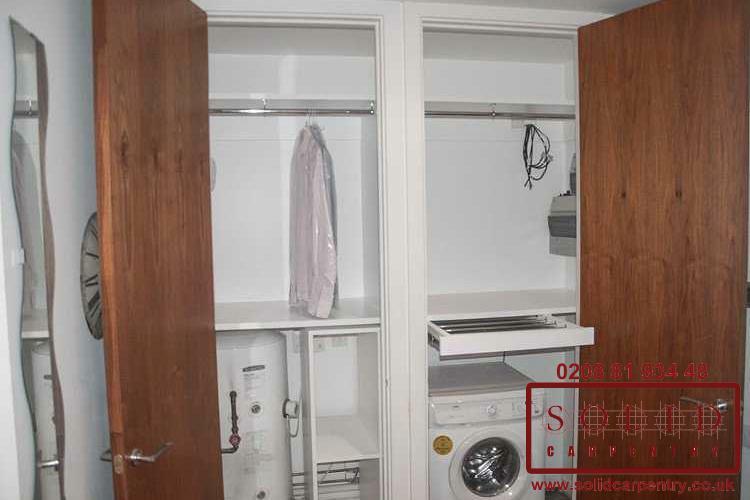 Do you have a room that would benefit from a bespoke storage unit? 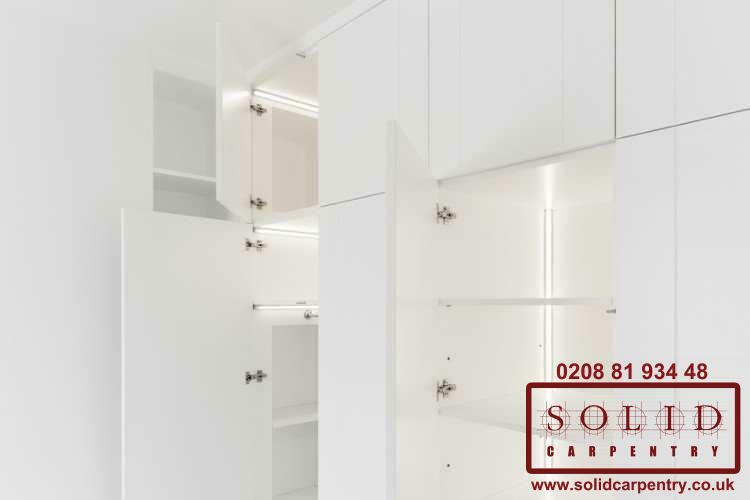 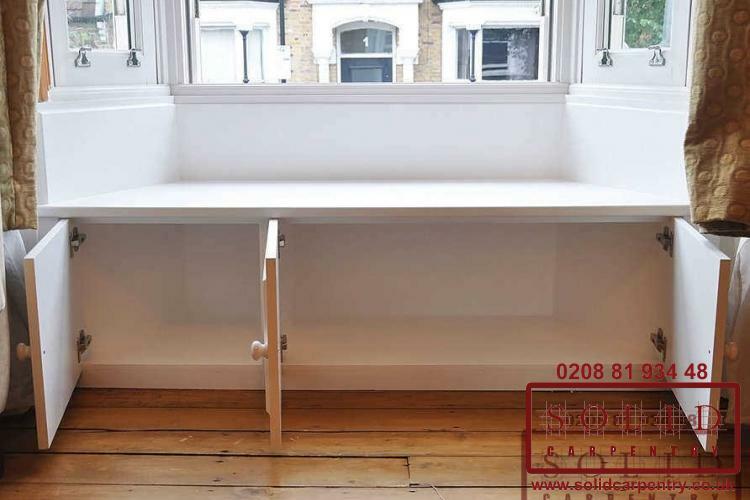 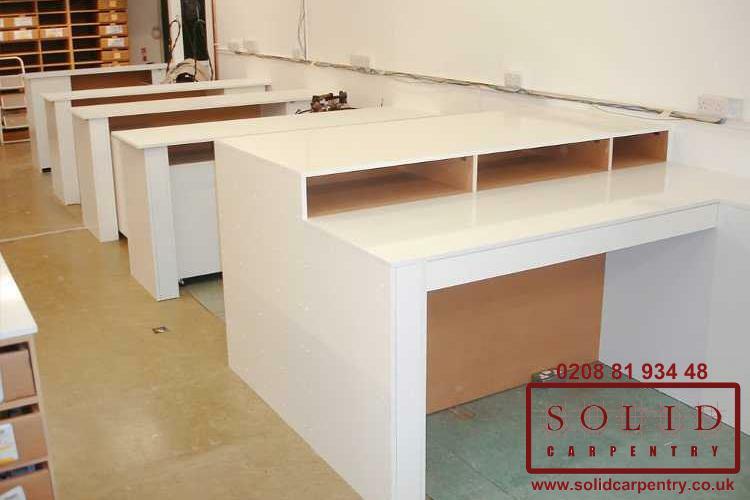 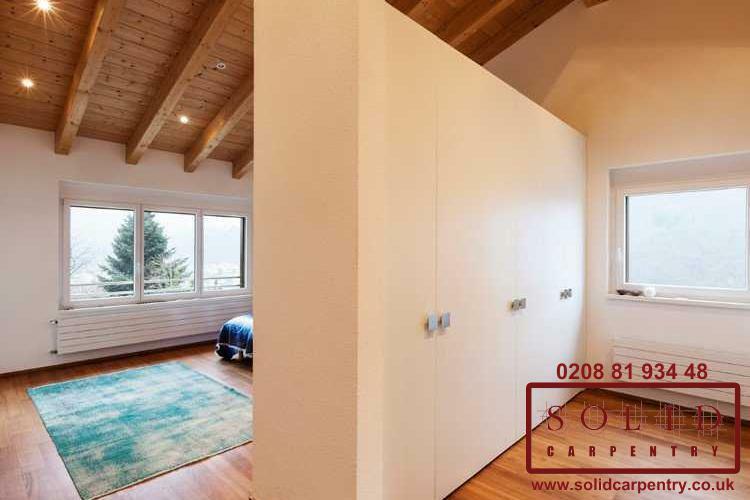 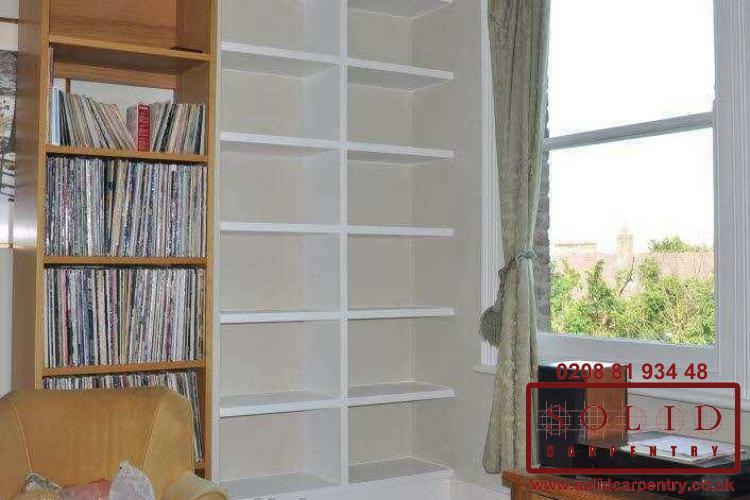 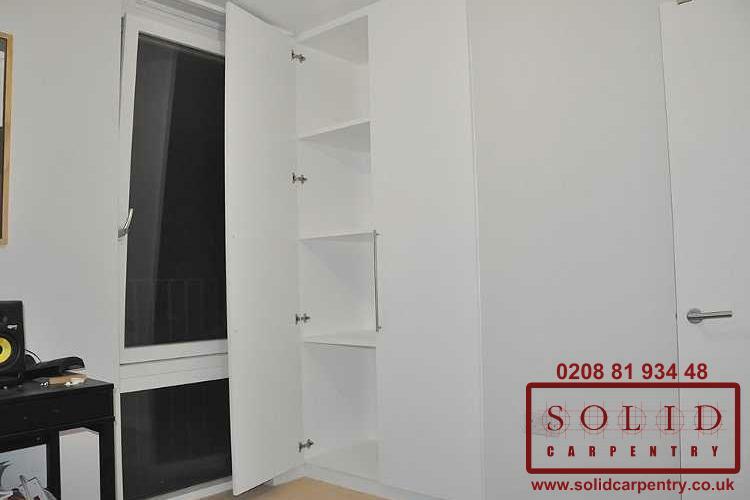 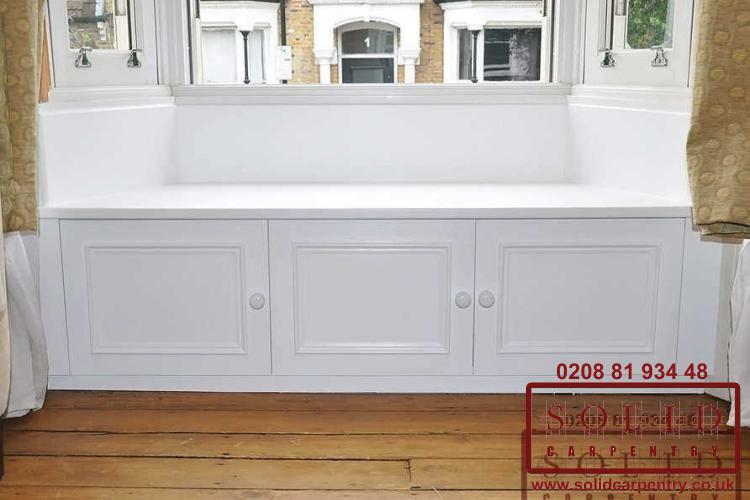 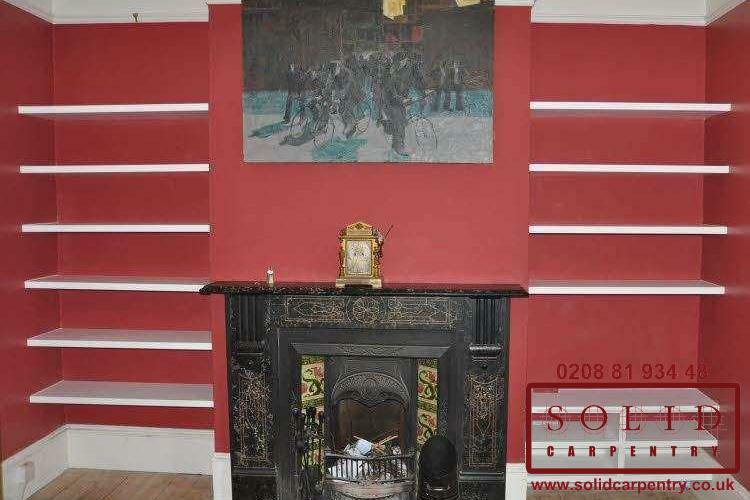 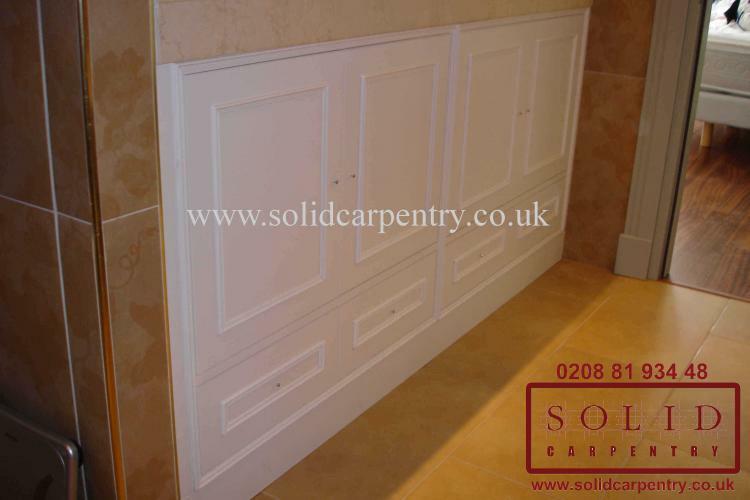 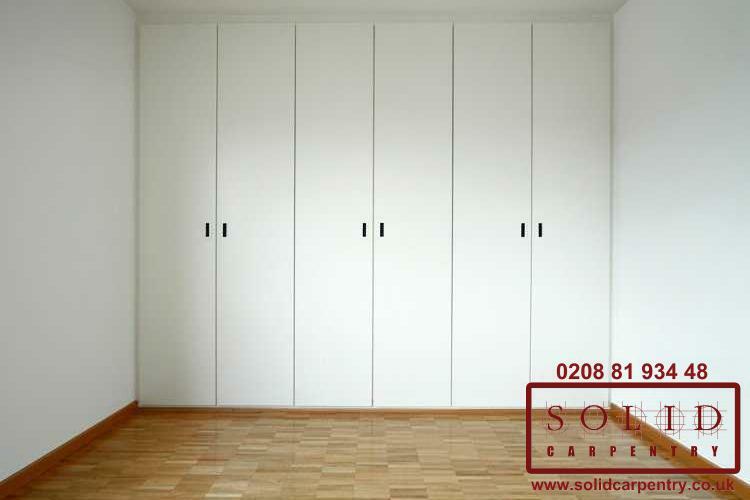 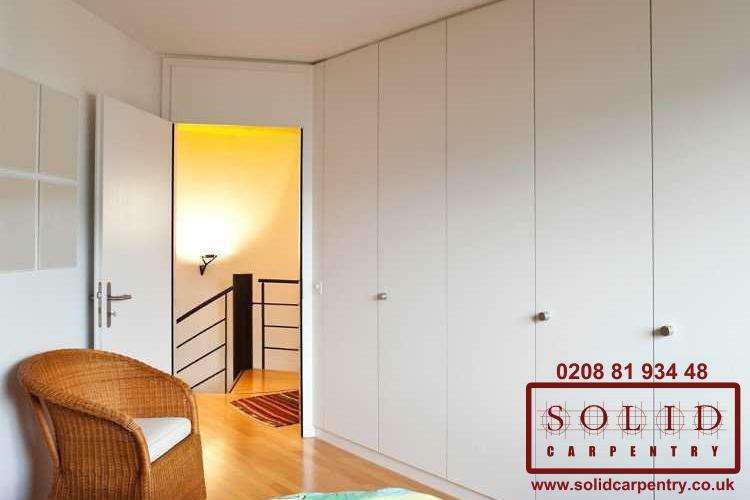 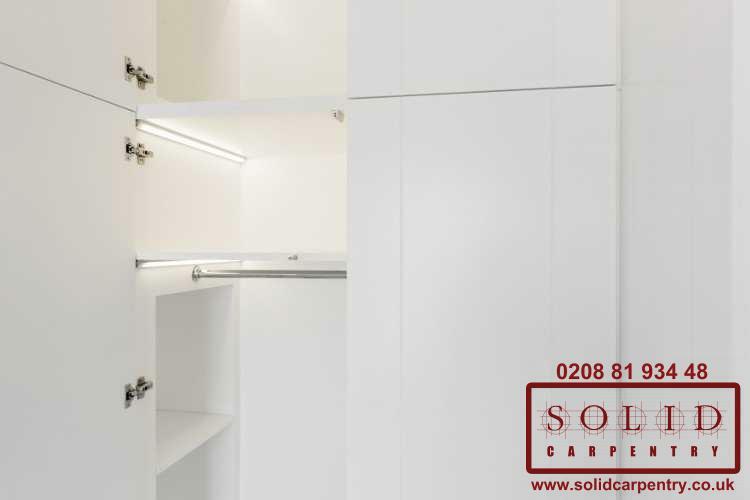 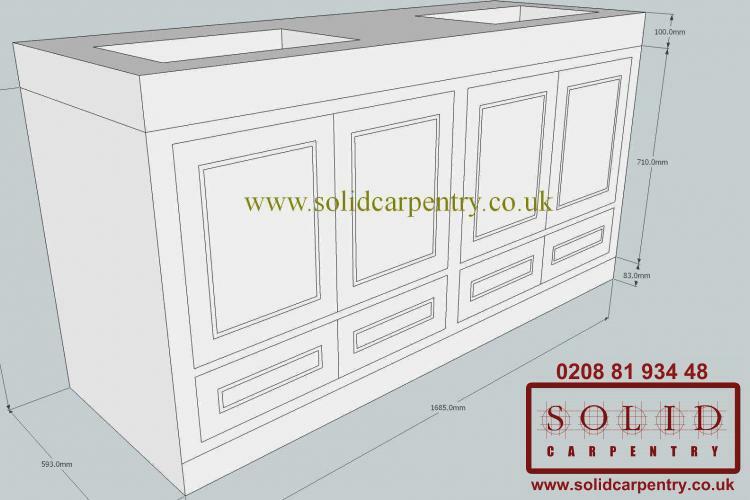 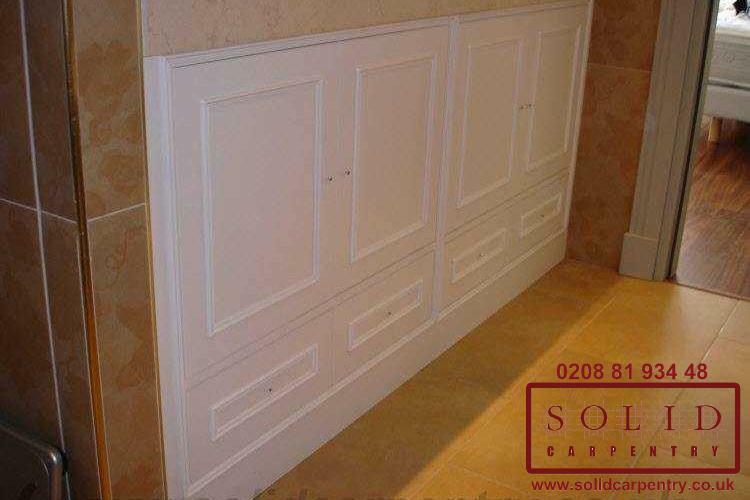 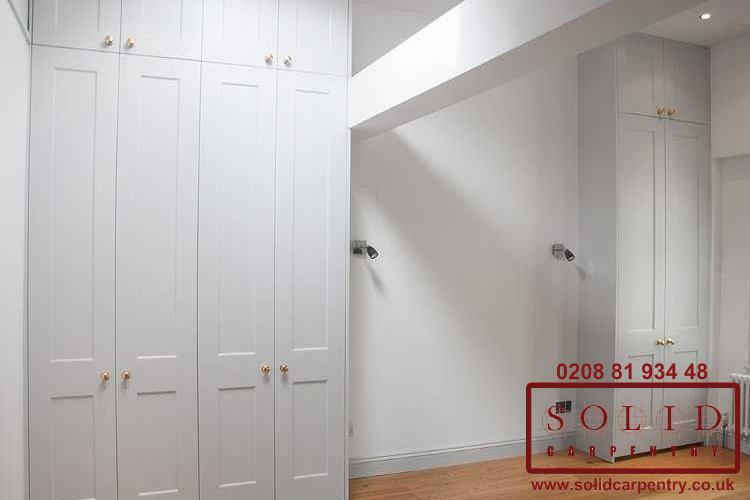 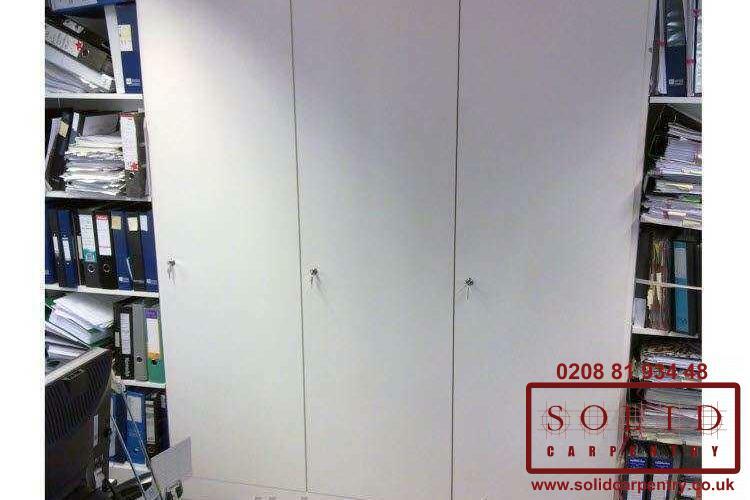 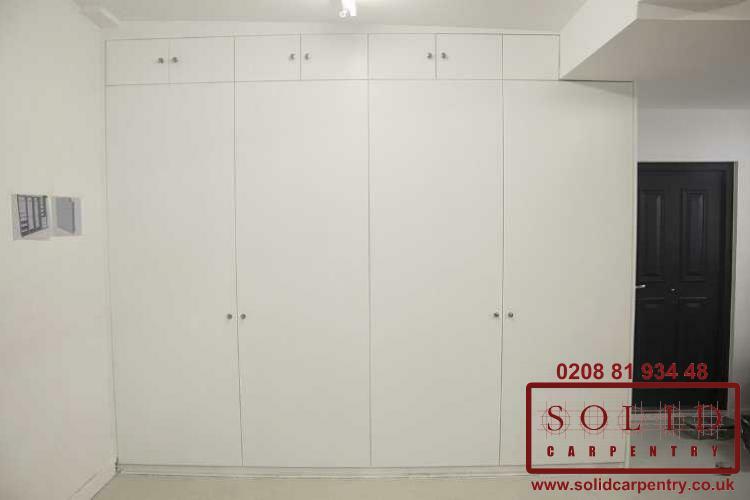 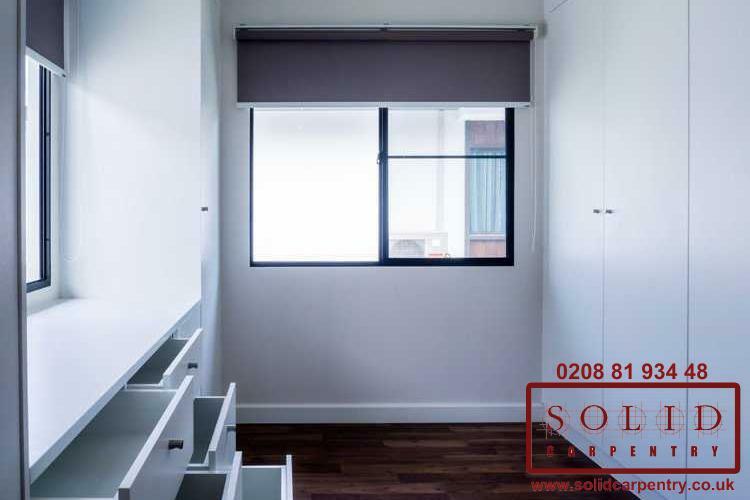 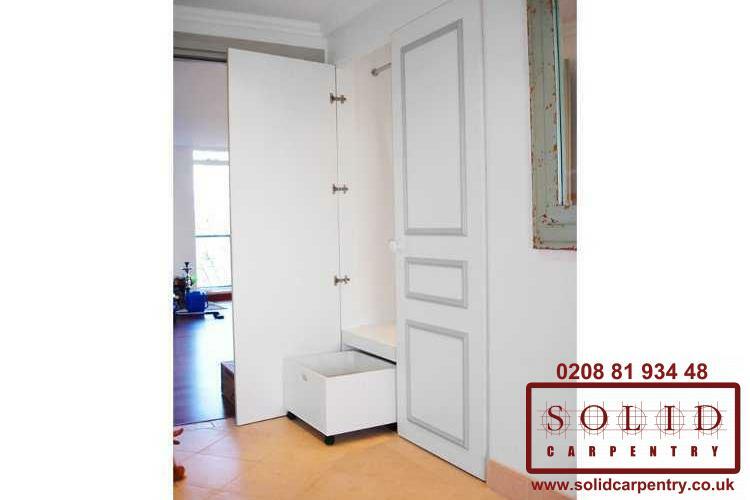 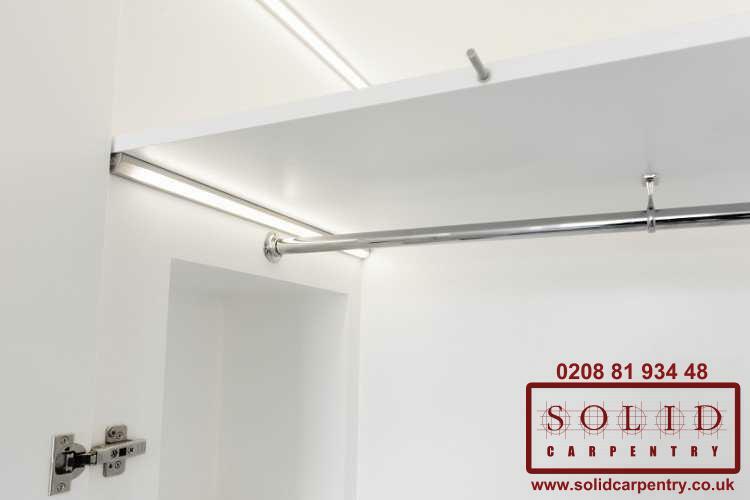 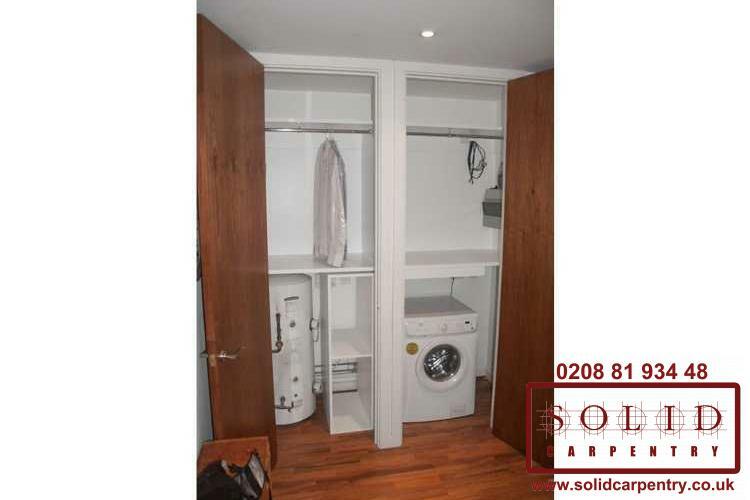 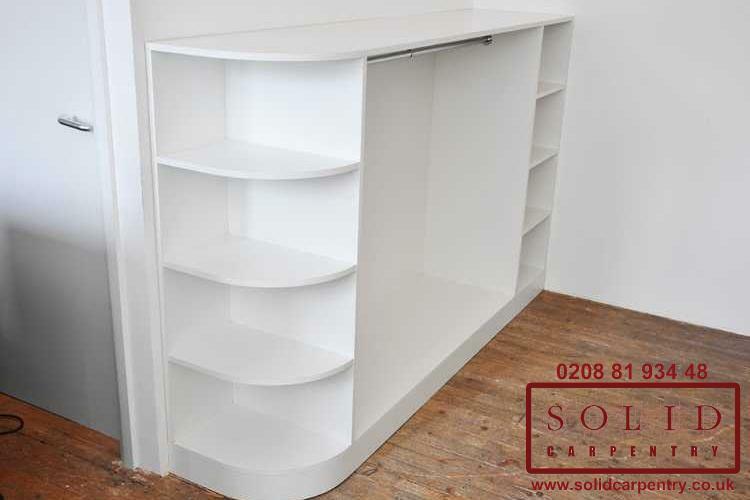 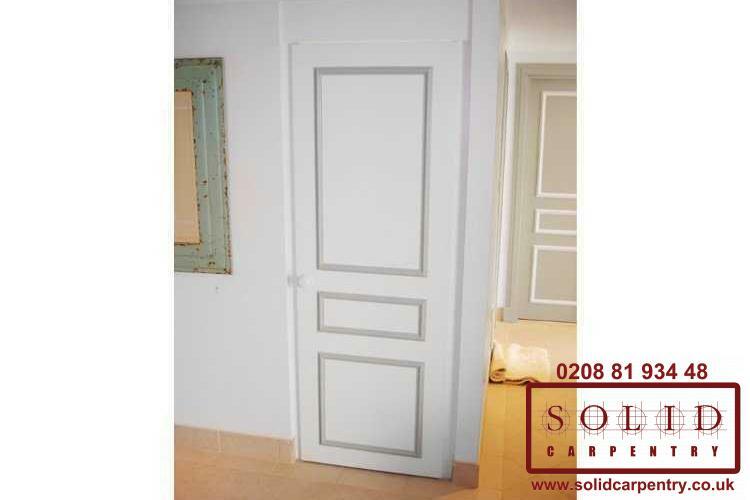 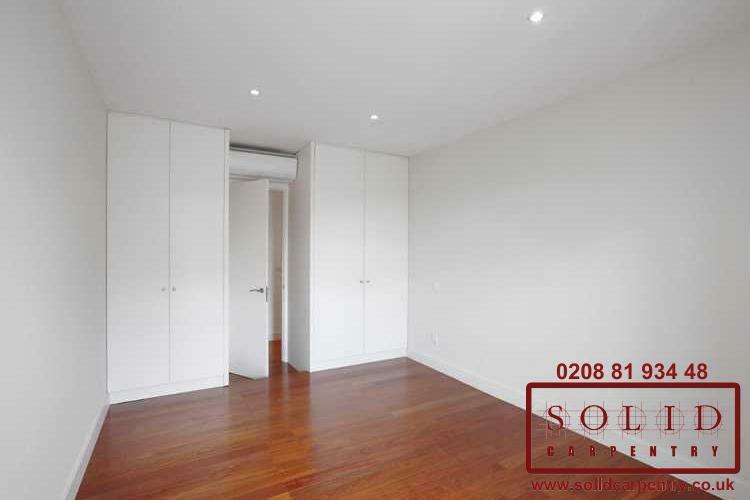 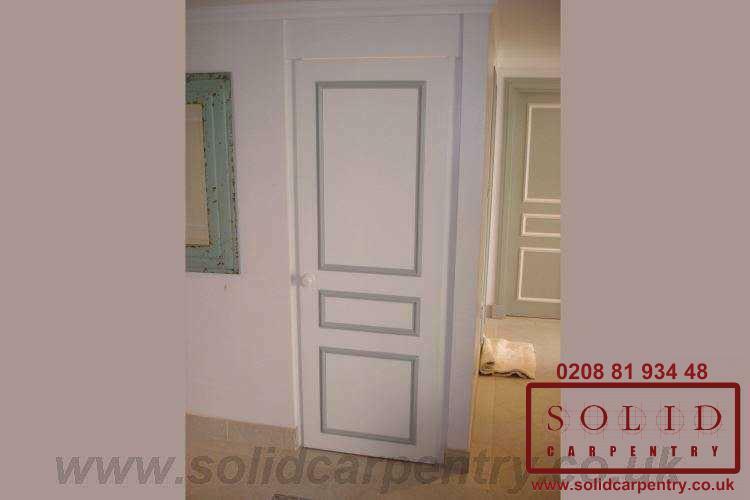 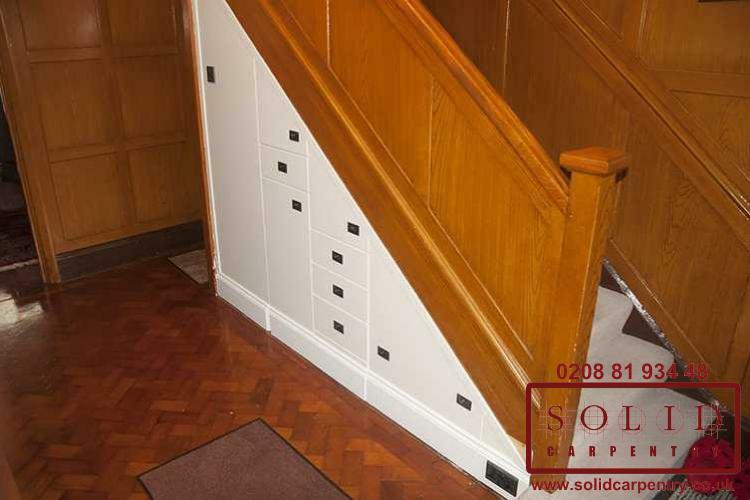 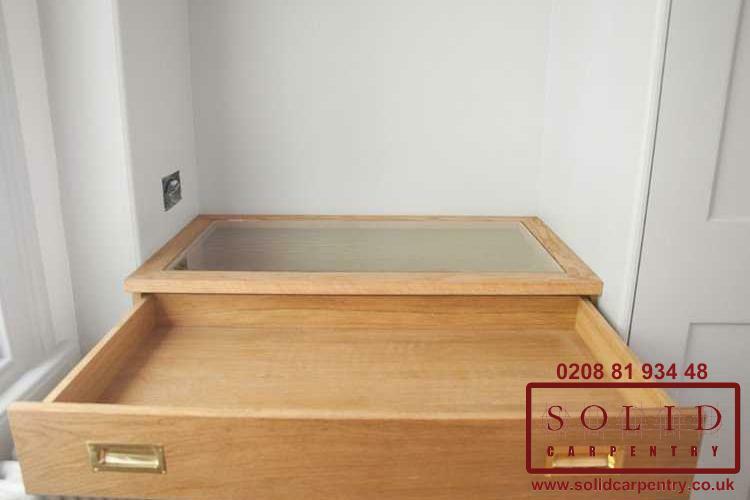 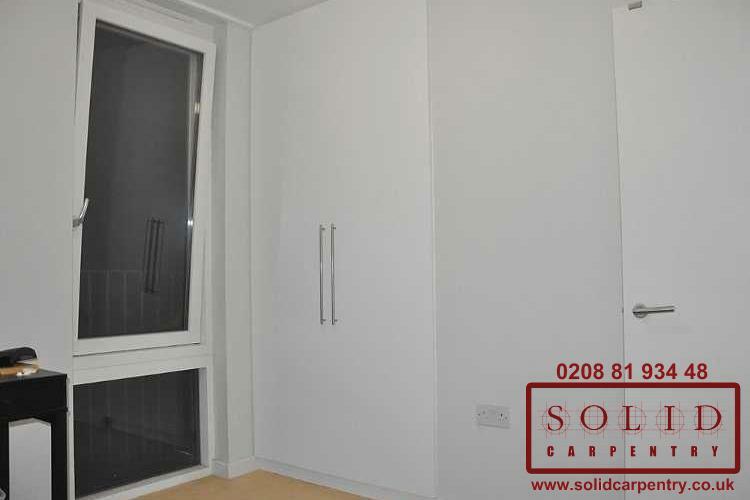 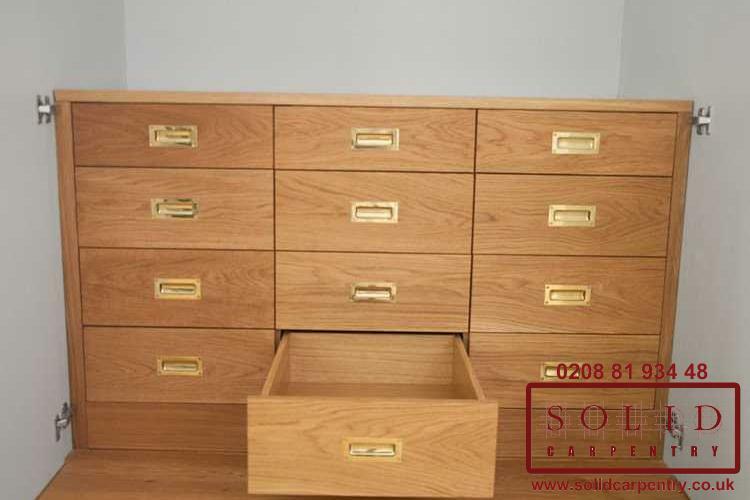 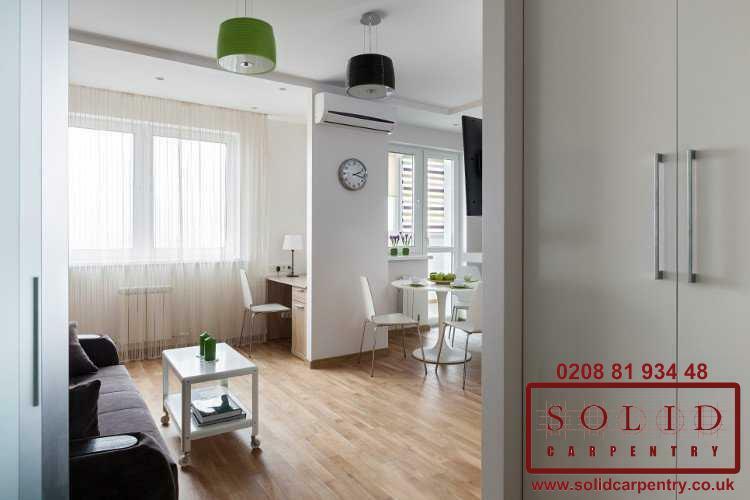 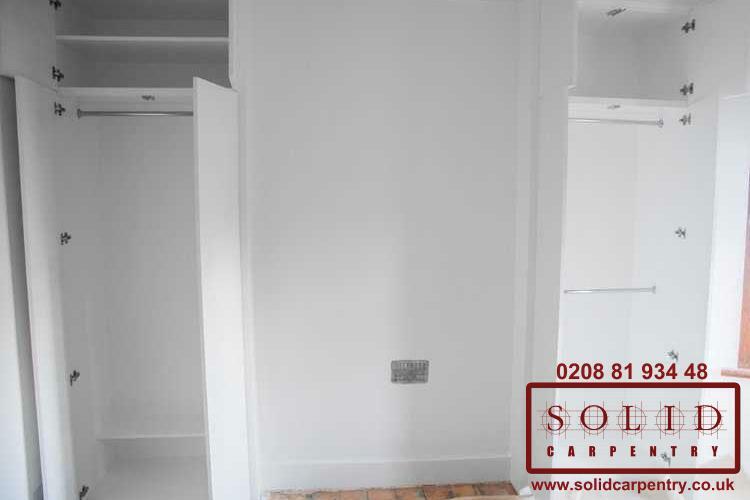 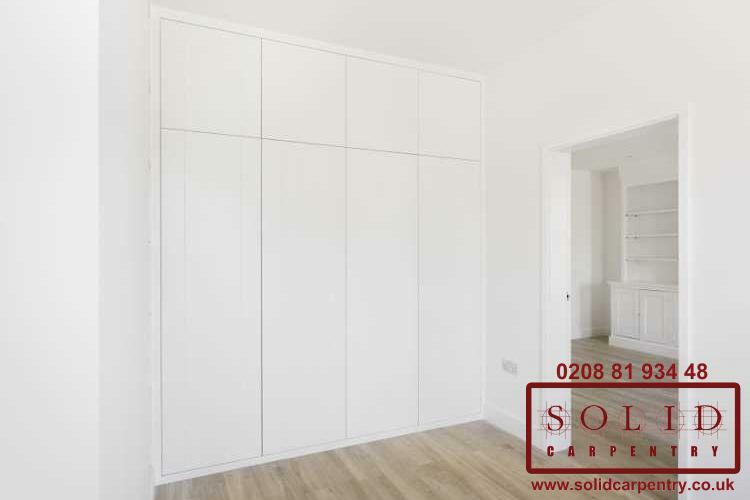 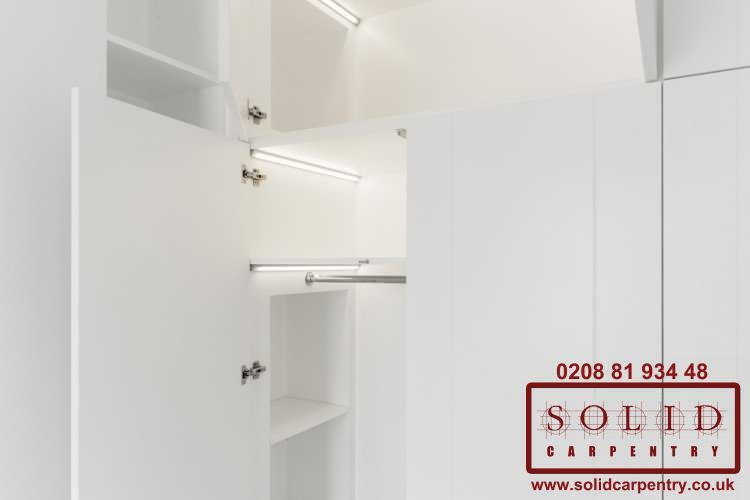 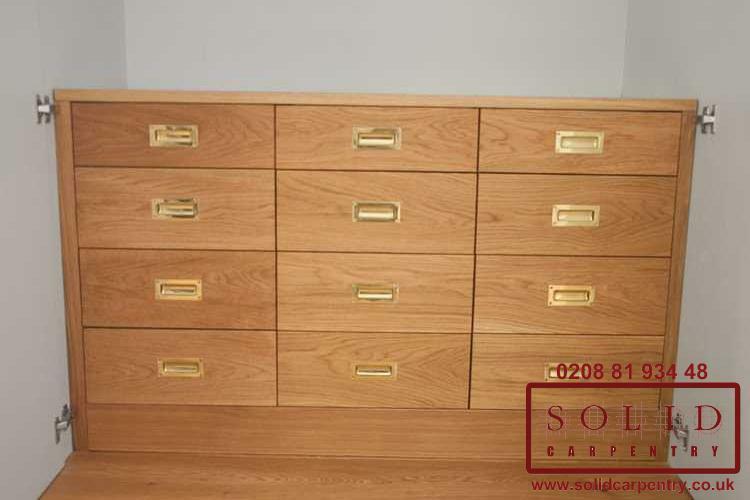 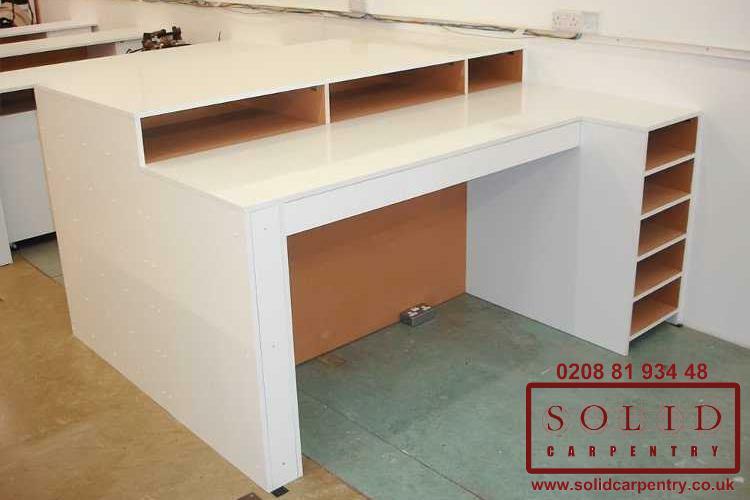 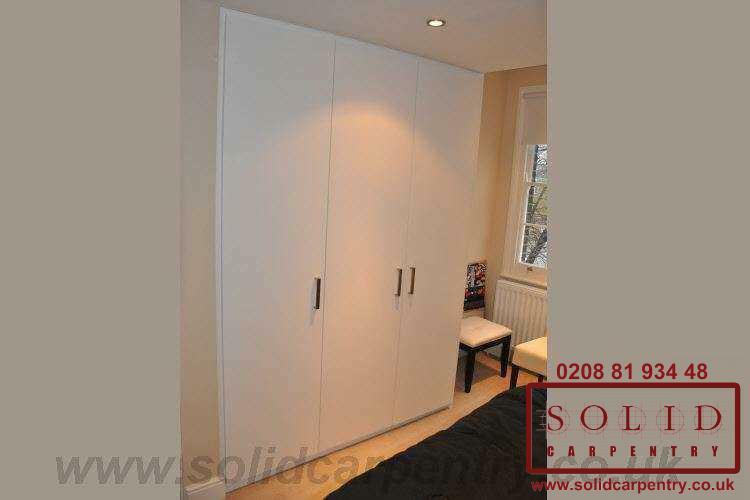 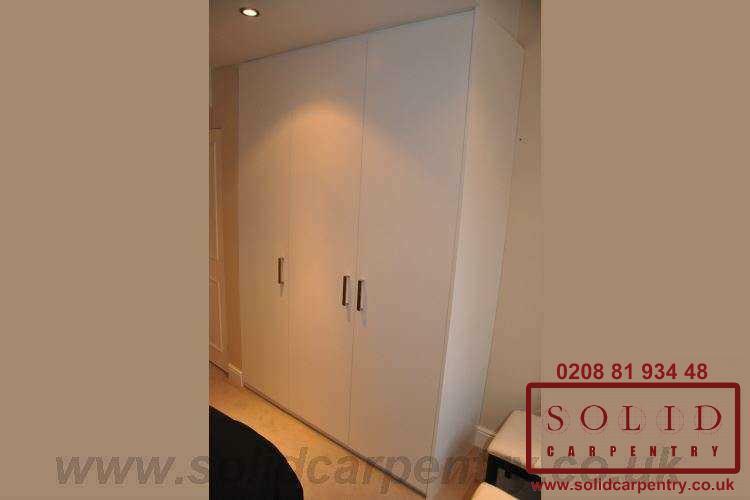 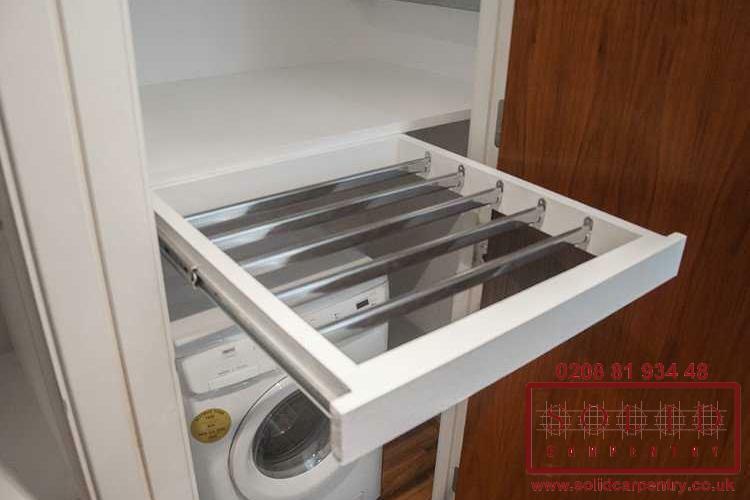 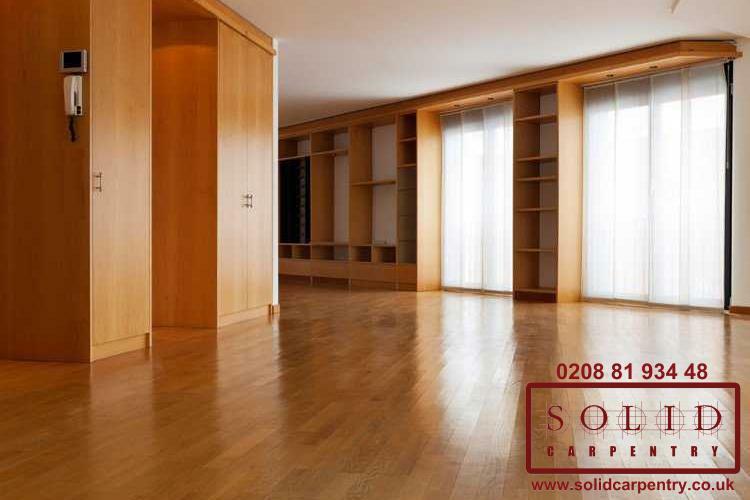 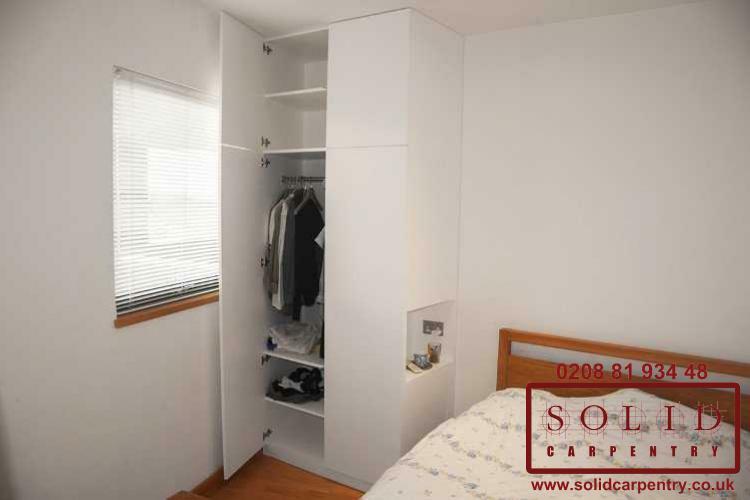 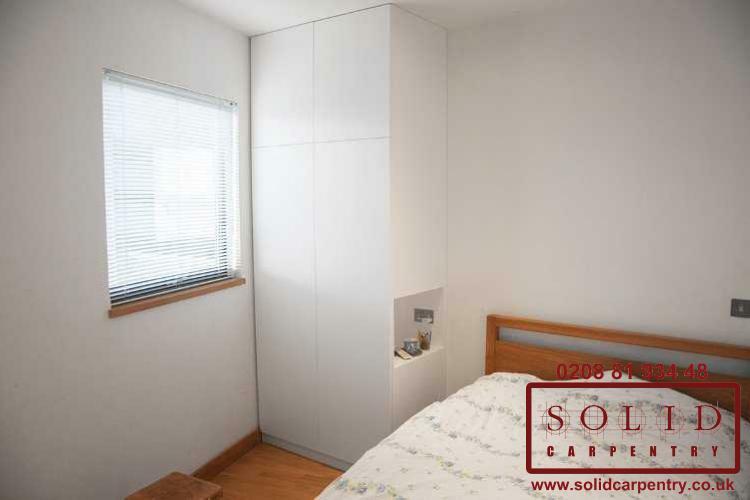 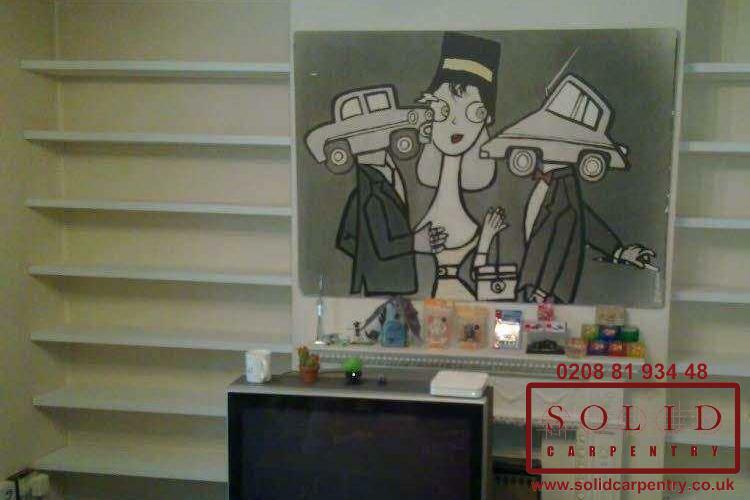 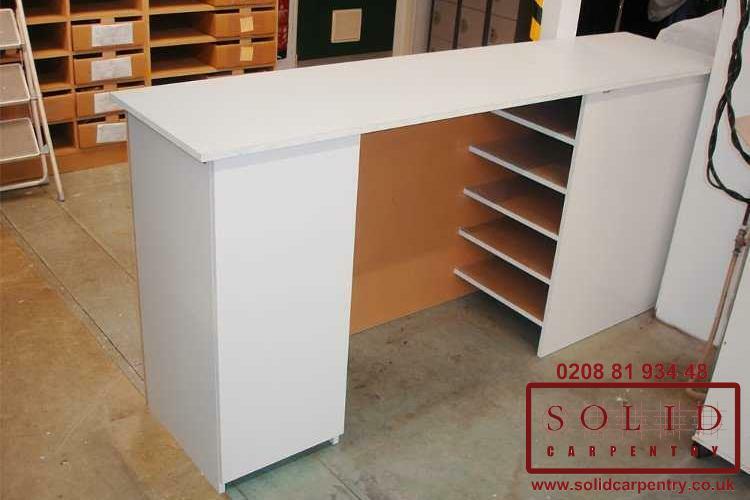 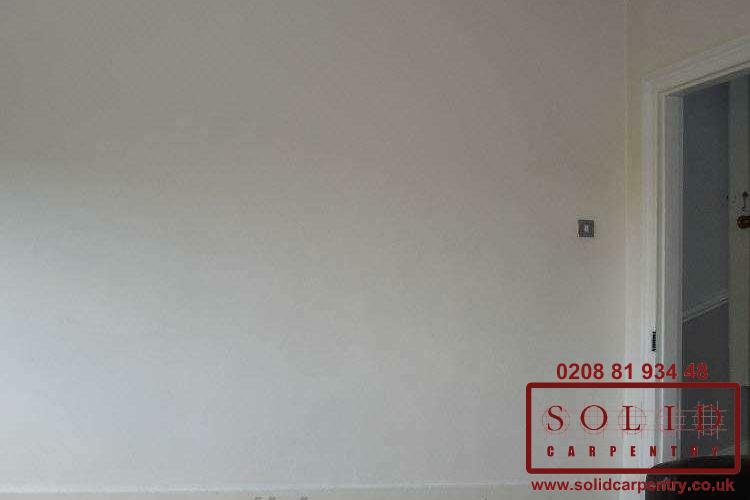 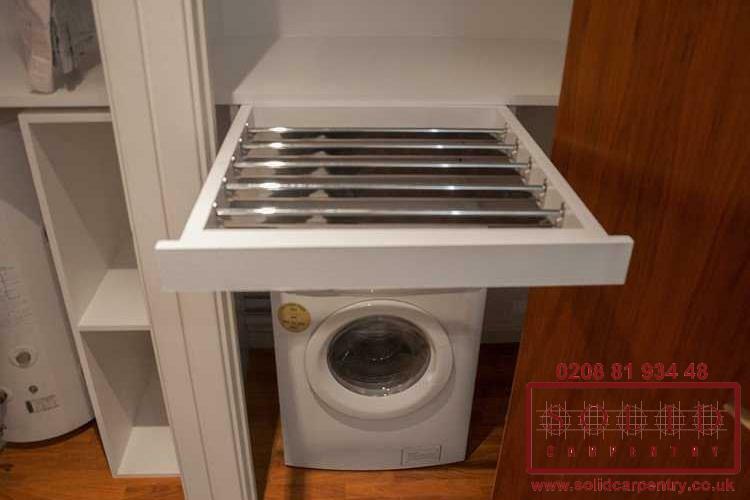 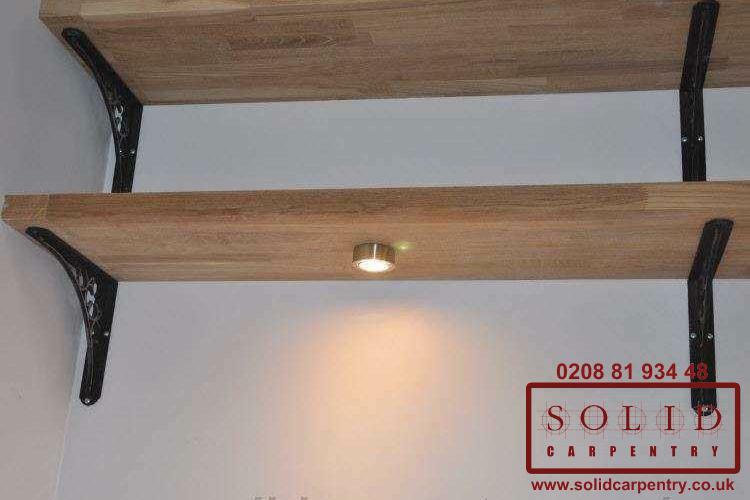 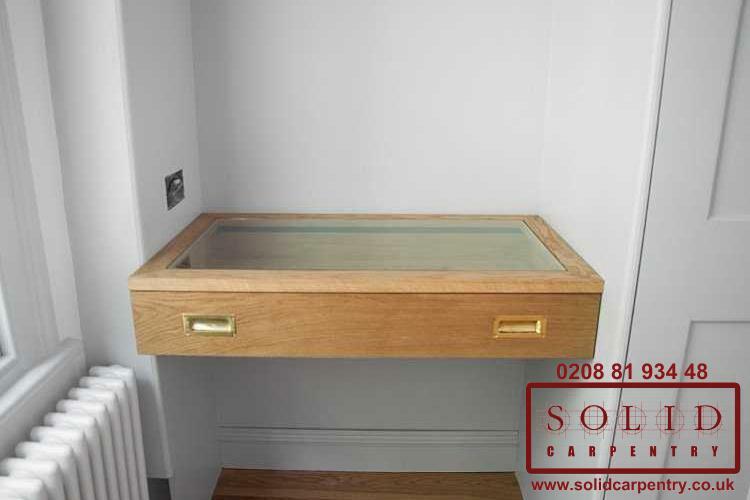 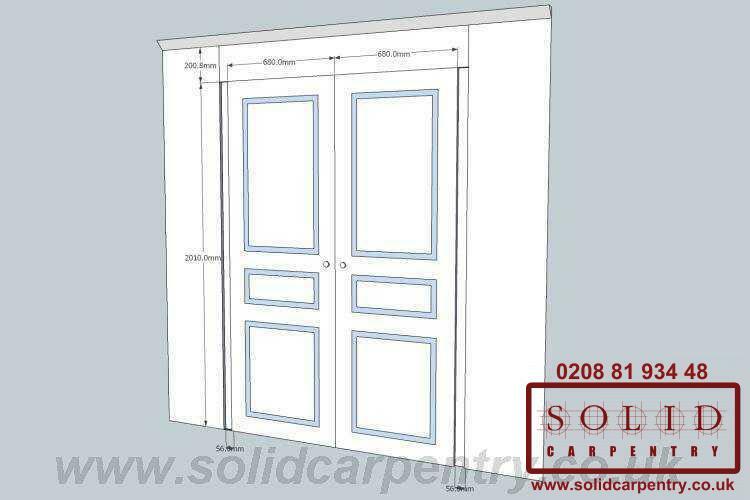 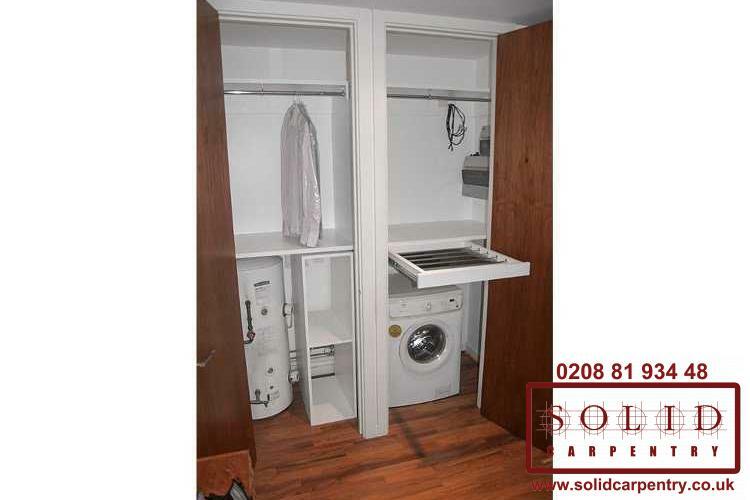 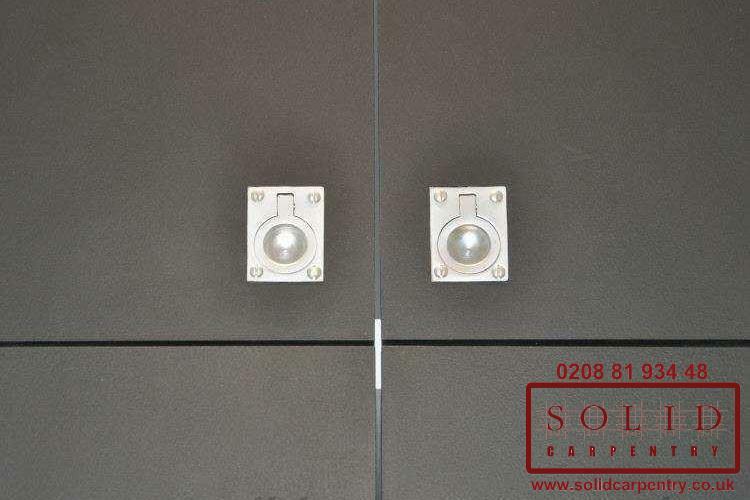 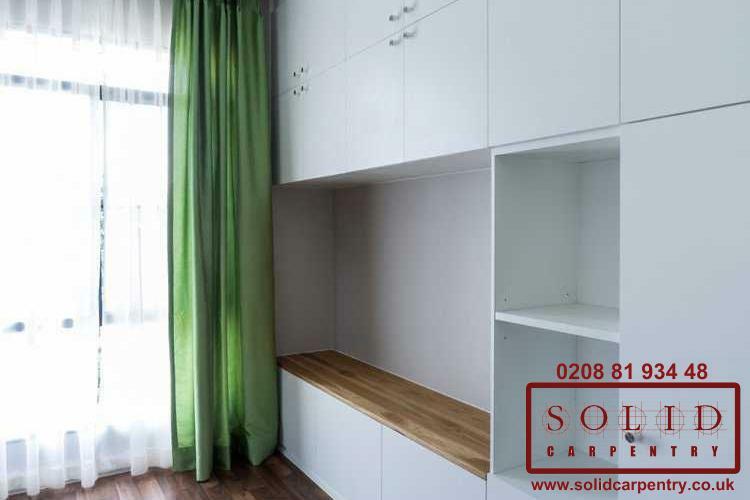 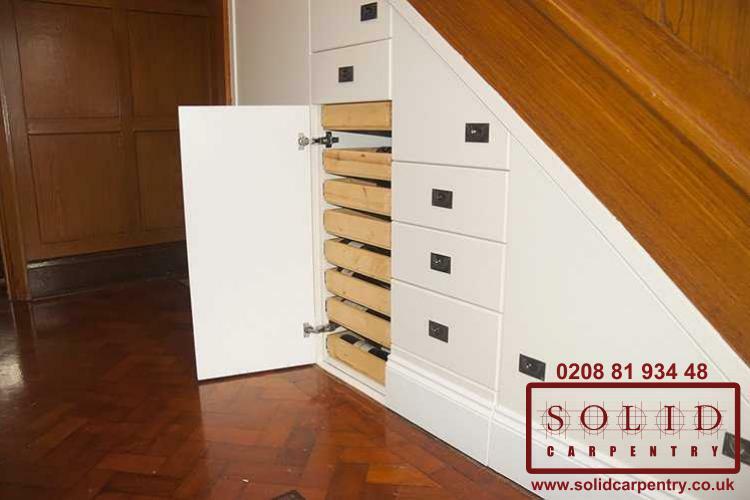 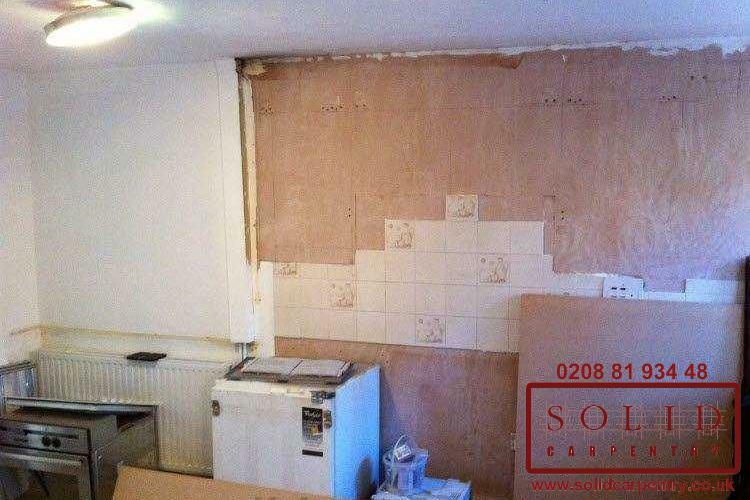 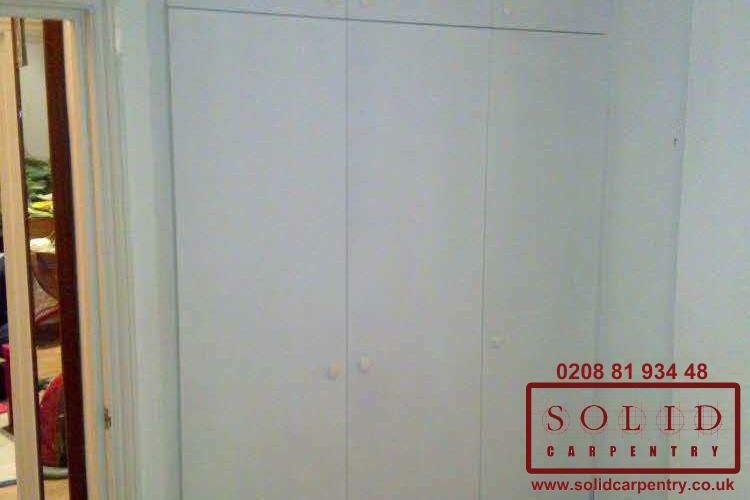 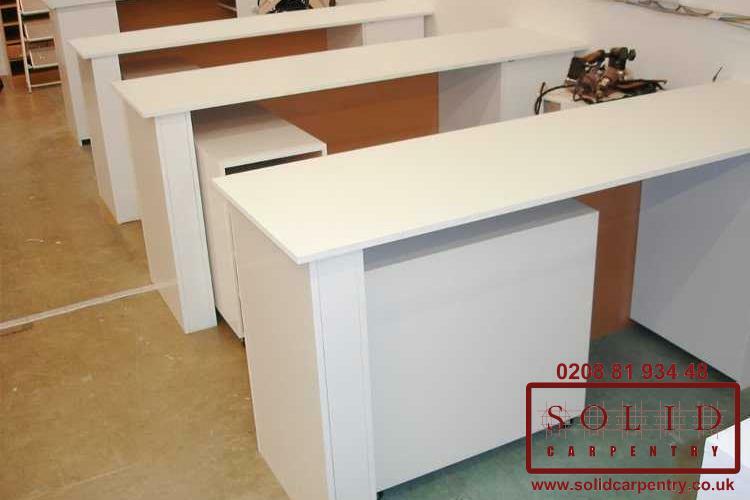 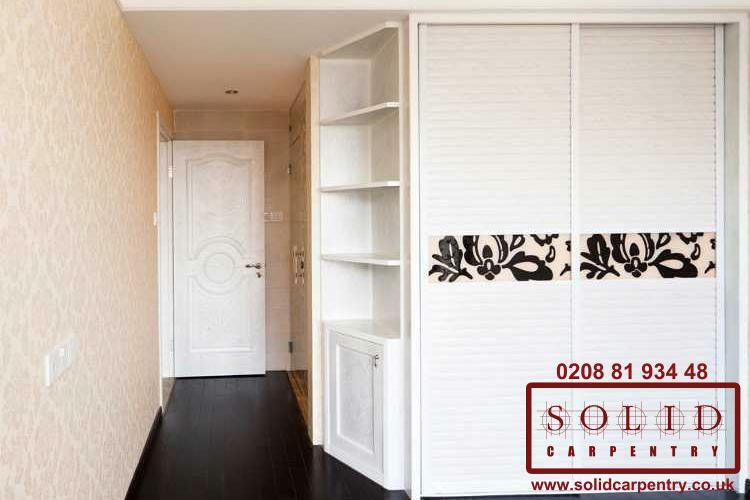 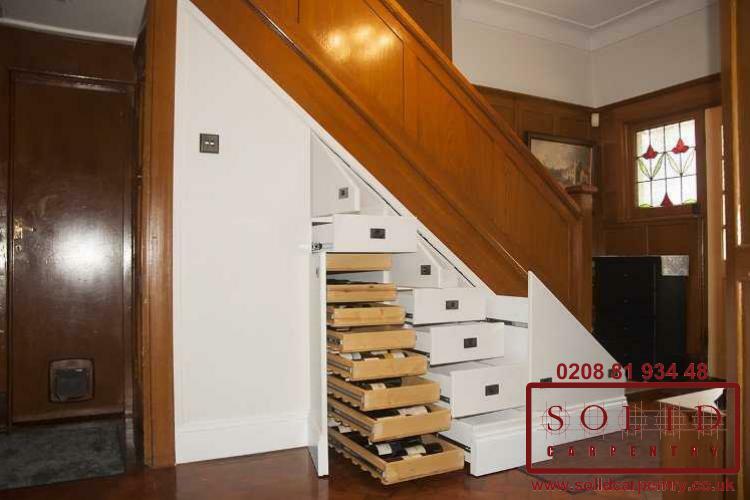 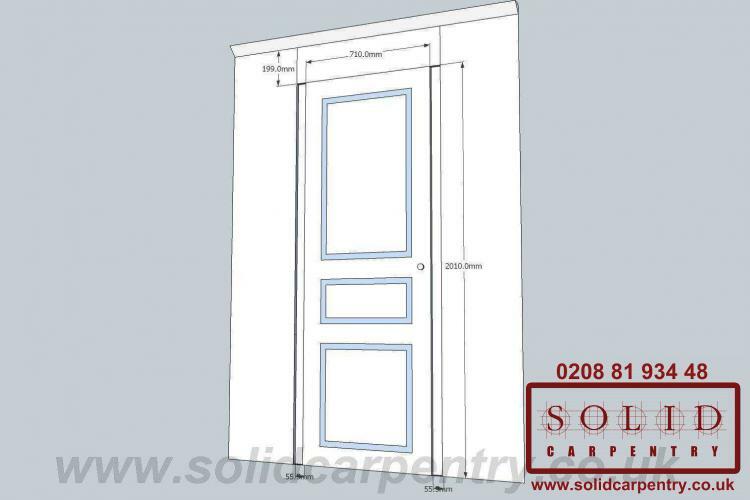 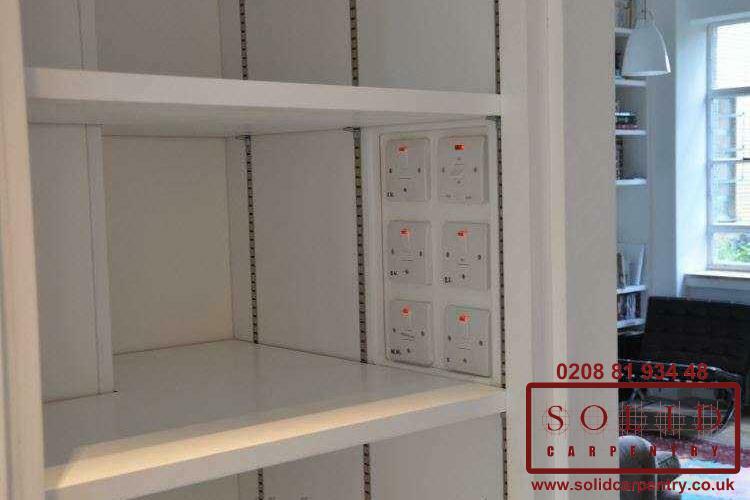 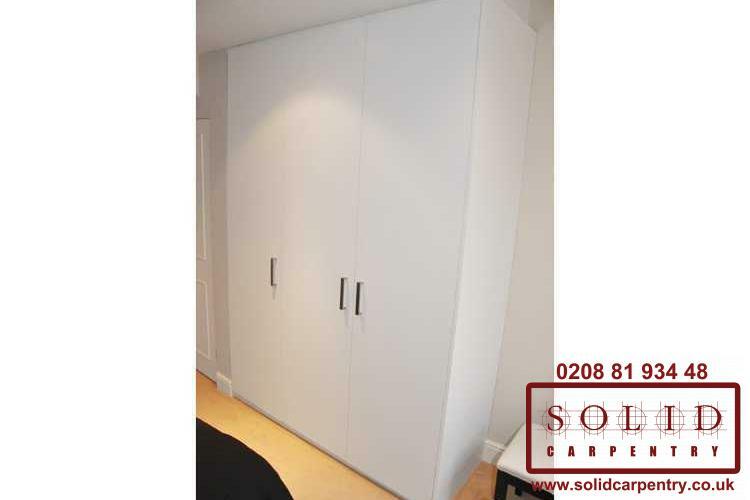 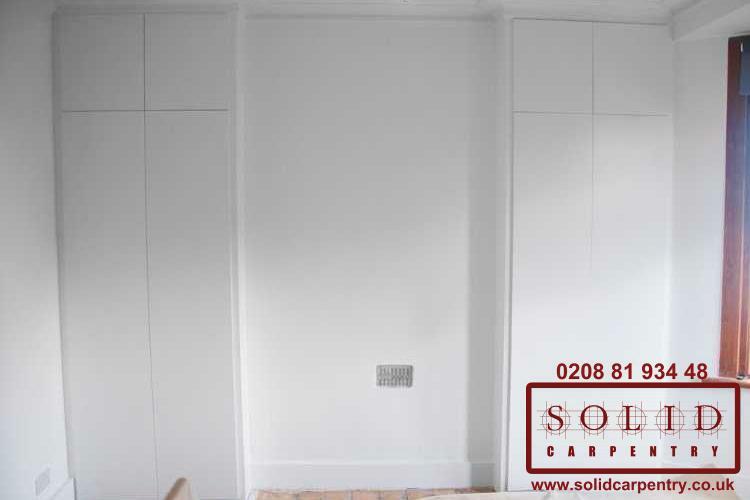 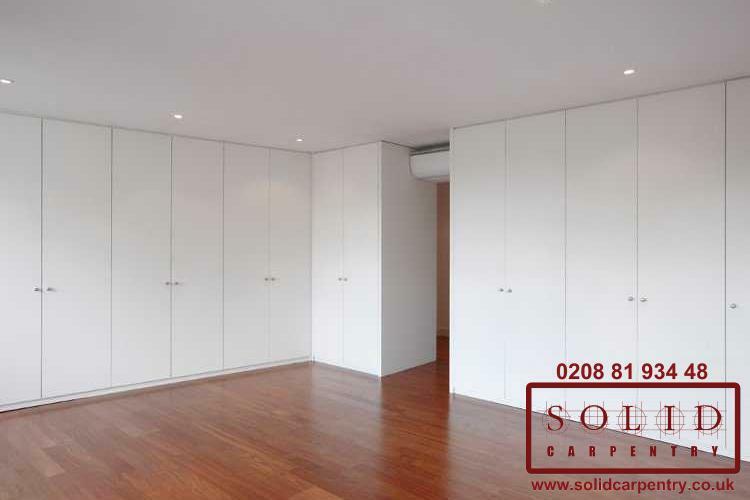 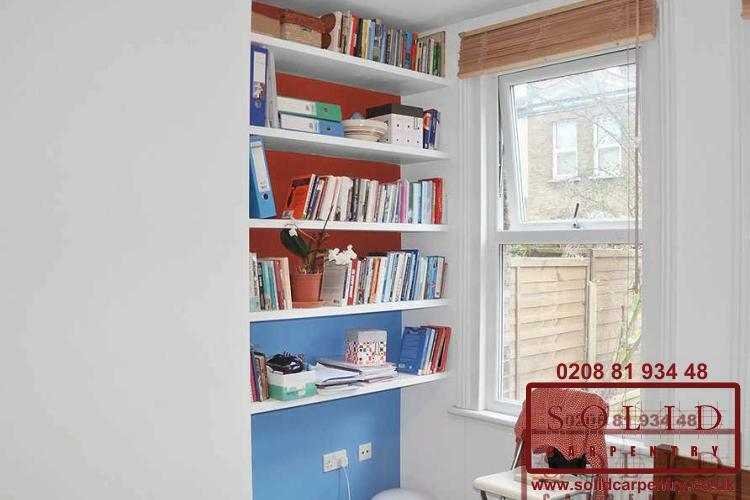 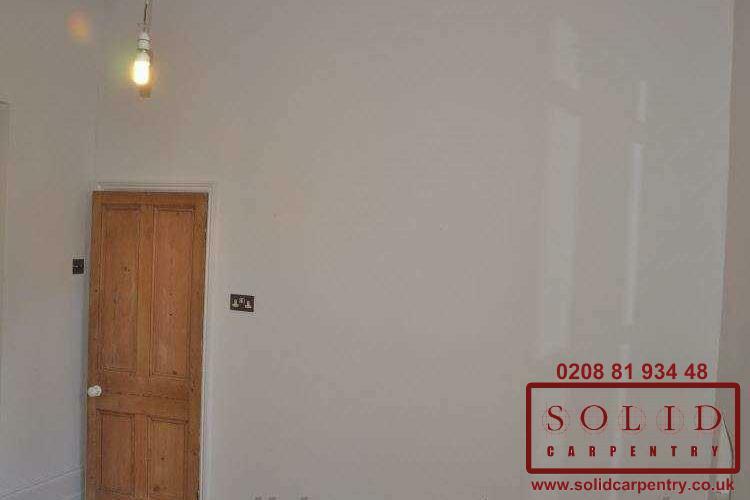 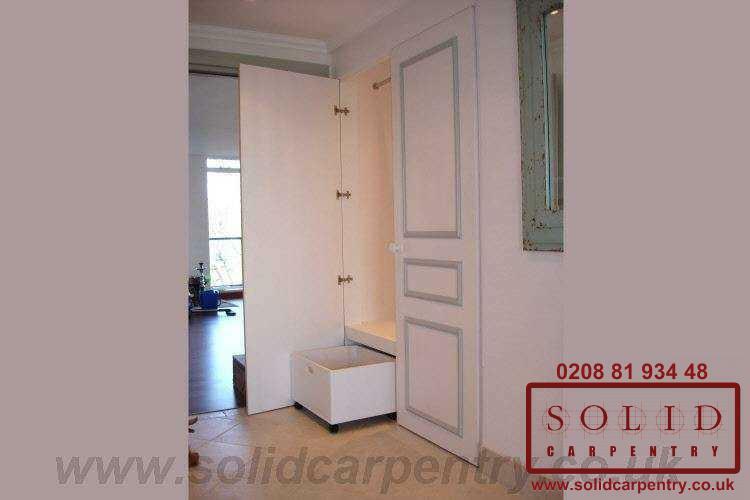 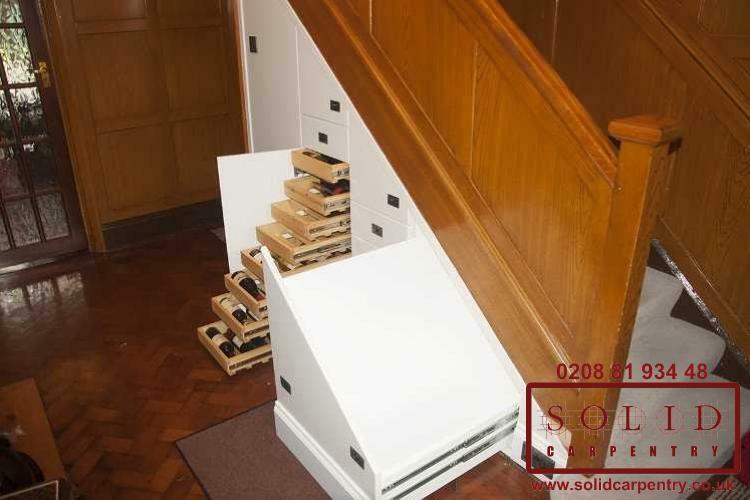 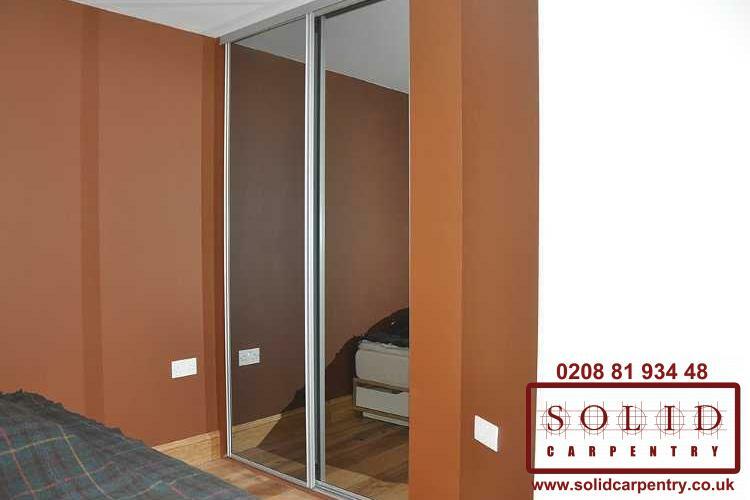 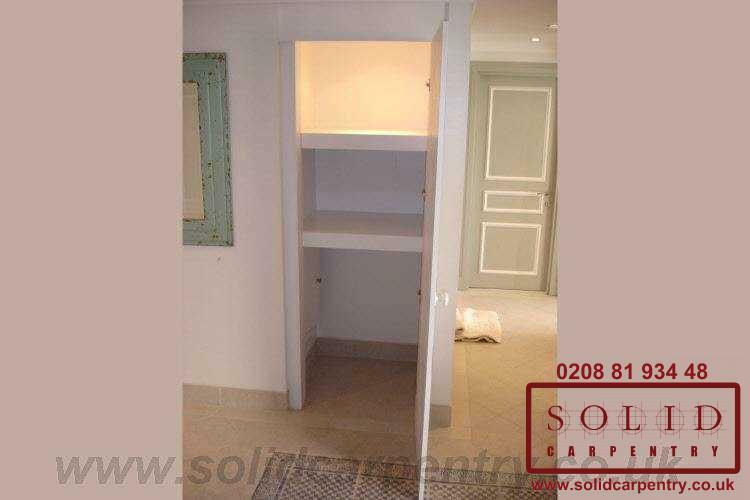 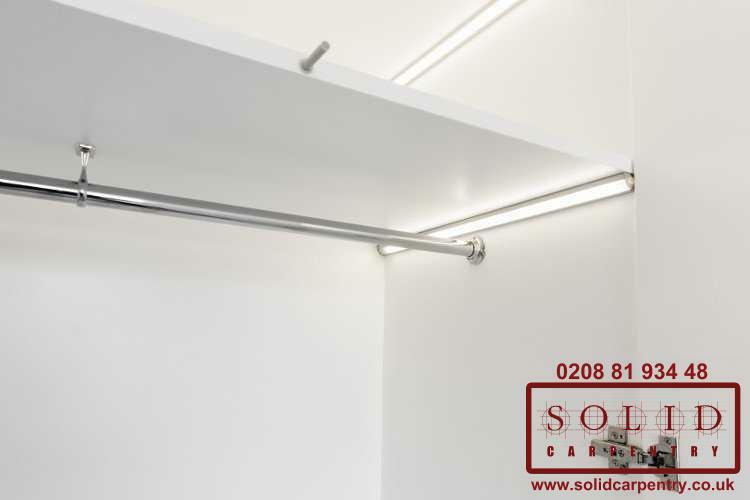 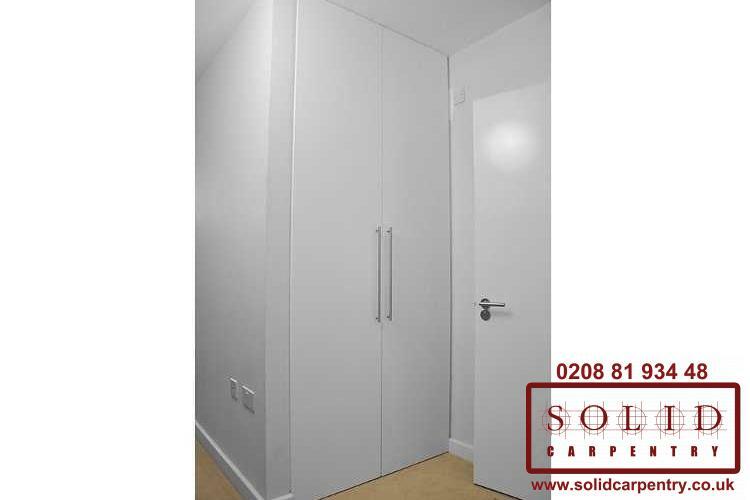 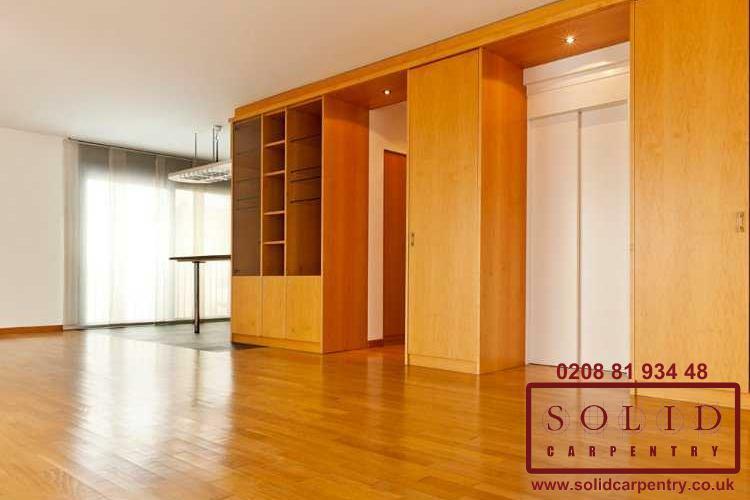 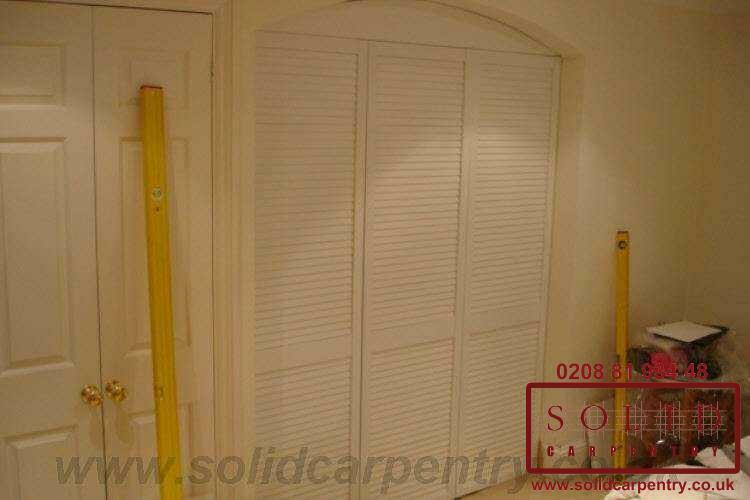 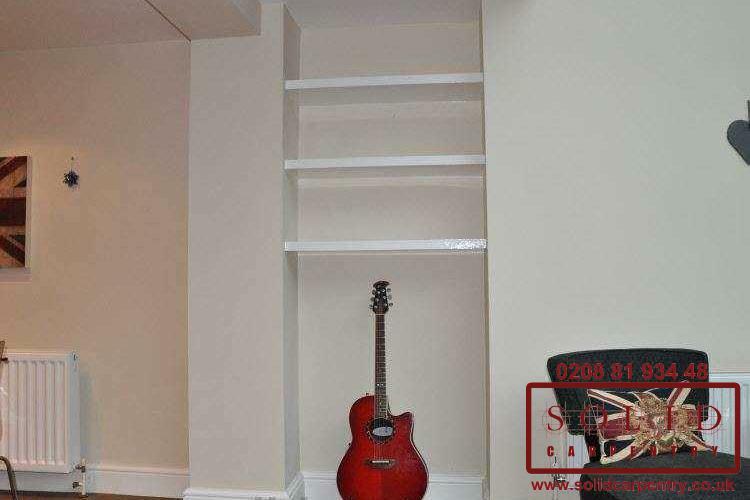 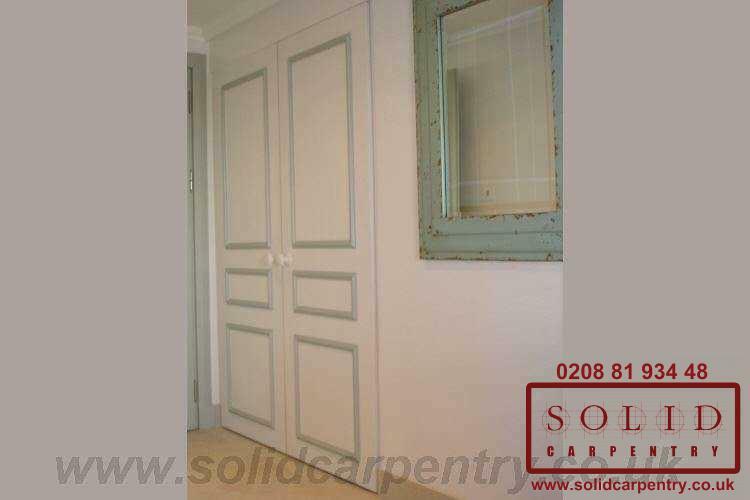 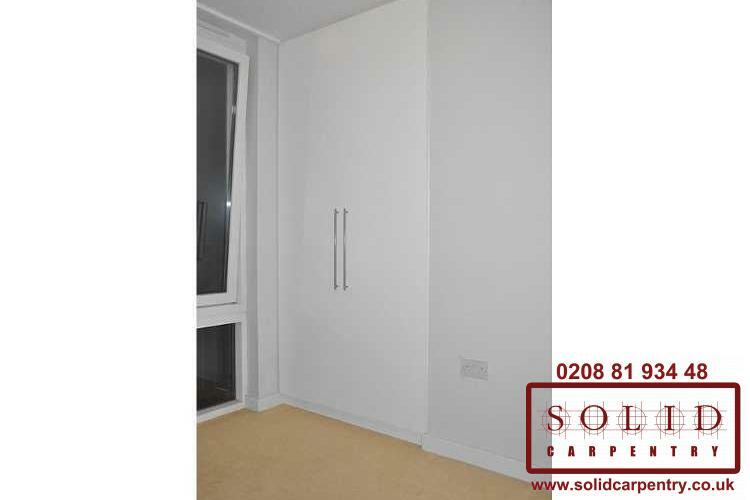 Contact us today or call 020 8819 3448 to discuss your fitted furniture requirements.